Join us for a field trip! The rock exhibits interesting erosion features such as deep narrow channels and bowls. These features were created by water carrying chert gravel and stones across the sandstone surface. Some of the chert gravel will be deposited into the depressions of the sandstone and over time will grind out huge bowls in the rock layer. The source of this stream is fed by many freshwater springs. The water quality is very good and is used as a standard for testing against other water sources. Good water quality is very important for many water species survival. 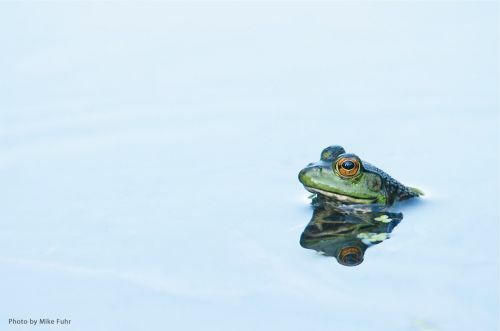 Water quality can be graded just by the species that inhabit the source. Learn more about freshwater in Oklahoma. 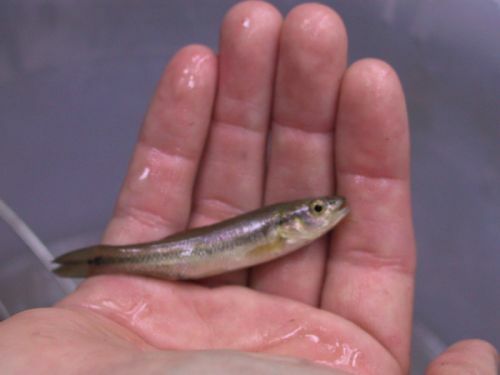 Freshwater stream fish include Central Stone Rollers, Shiners, and Darters. Oklahoma freshwater streams provide habitat for many different stream fish species. 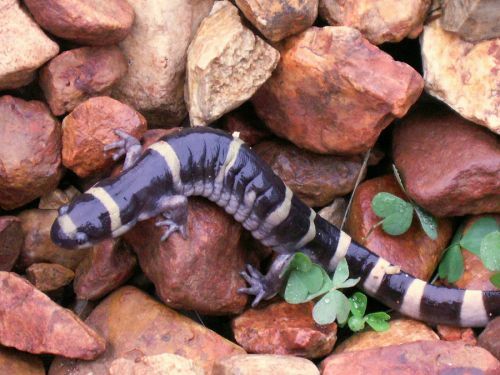 The Nickel Preserve harbors a suite of salamander species that are uncommon or endemic to the Ozarks. The size and ecological quality of the preserve provides for healthy populations of these salamanders. 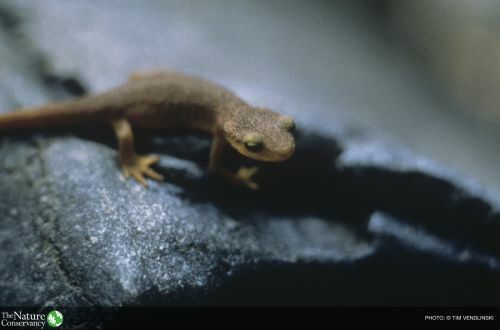 The Cave Salamander (Eurycea lucifuga) eats small insects and spiders and grows to be 4-6 inches long. They prefer moist woodlands, cliff fissures, and caves in limestone for their habitat. Learn more about salamanders at the Nickel Preserve. This soda pop can is an example of how litter from humans is a big pollutant in water systems. Water quality is very important for human survival. Please help keep our streams and water systems clean and free of litter debris. The Nature Conservancy of Oklahoma invites you to enjoy the outdoors – and the places that you've helped us protect. From species surveys and volunteer workdays to hikes and educational presentations, there are many ways to both enjoy and support the work of The Nature Conservancy. 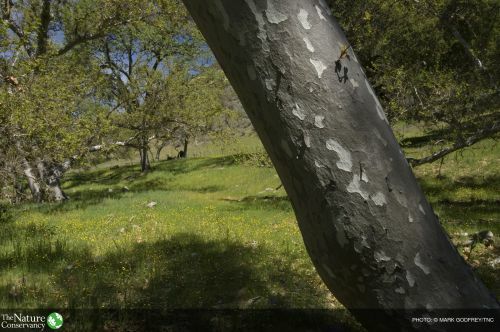 Since most of The Nature Conservancy's preserves are private, these field trips provide unique opportunities to see Pontotoc Ridge Preserve. Check on our upcoming events here! The timber rattlesnake, canebrake rattlesnake or banded rattlesnake, is a species of venomous pit viper endemic to the eastern United States. This is the only rattlesnake species in most of the populous northeastern United States and is second only to its cousins to the west, the prairie rattlesnake, as the most northerly distributed venomous snake in North America. 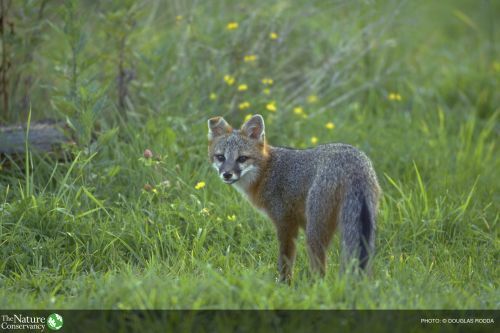 Gray Fox (Urocyon cinereoargenteus) sightings are not common, but the gray fox does inhabit the preserve. Gray fox eat small mammals, fruit, berries, and insects. The gray fox can even climb trees in search of a food source. The gorgeous Red-headed Woodpecker is so boldly patterned it’s been called a “flying checkerboard,” with an entirely crimson head, a snow-white body, and half white, half inky black wings. These birds don’t act quite like most other woodpeckers: they’re adept at catching insects in the air, and they eat lots of acorns and beech nuts, often hiding away extra food in tree crevices for later. This magnificent species has declined severely in the past half-century because of habitat loss and changes to its food supply. 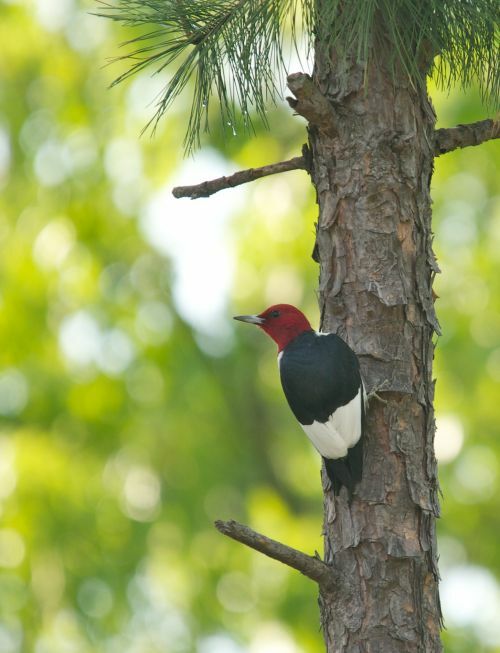 The Pontotoc Ridge Preserve provides vital habitat for the Red-headed woodpecker. The Blue River is the largest discharge feature from the Arbuckle-Simpson Aquifer. It is one of Oklahoma’s last two free-flowing rivers—meaning they don’t have a high dam and reservoir regulating the stream flow. The Blue River is one of Oklahoma’s most unique streams historically home to 23 species of freshwater mussels and 82 native fish species. This river is also an integral part of the local economy and it provides drinking water for the City of Durant, Oklahoma. Our efforts to approach conservation in a pragmatic, collaborative way have served us well for more than two decades. It is for that very reason we are applying this philosophy to our stream work across the state, through our freshwater program. 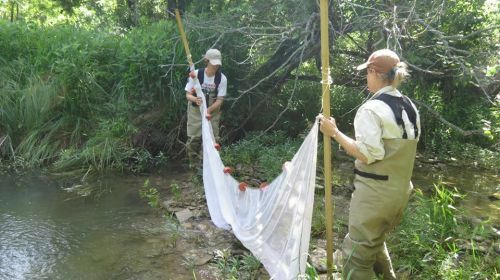 Since the launch of the program in 2012, we completed a three-year monitoring plan on 15 streams at various Conservancy preserves. With the help of staff and volunteers, we collected aquatic data on the biology, water quality, hydrology, and geomorphology. This data will be utilized to refine conservation strategies and track conservation results in the future. Corbicula mussels are an invasive species to the Blue River. 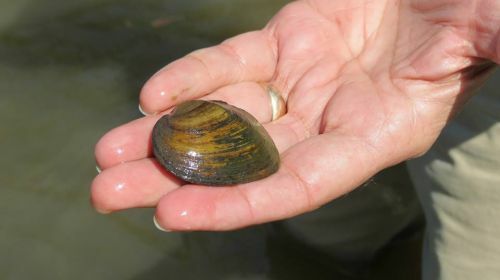 These cause the most problems in private ponds of any mussel found in the United States. They have been in North America since the early 1900s when they arrived from Asia likely in the ballast of ships, although there is some evidence that they were intentionally released. These small clams have spread all over the continent causing billions of dollars of damage. This clam thrives in flowing and standing water with sufficient calcium and productivity. If the water conditions and sediments are right, these clams can reach numbers of several thousand per square yard. If Corbicula clears the water of algae, the food chain is broken, and clear water permits weed growth and reduces fish production. Control methods are extremely limited for Corbicula. 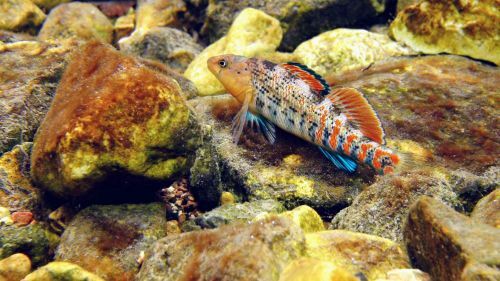 The orangethroat darter (Etheostoma spectabile) is a species of darter endemic to the central and eastern United States where it is native to parts of the Mississippi River Basin and Lake Erie Basin. Its typical habitat includes shallow gravel riffles in cooler streams and rocky runs and pools in headwaters, creeks, and small rivers, with sand, gravel, rubble, or rock substrates. It forages on the bottom for the aquatic larvae of midges, blackfly, mayfly and caddisfly, as well as isopods and amphipods. Spawning takes place in spring, the selected sites often being the upper stretches of riffles with sandy and gravelly bottoms interspersed with larger cobble. 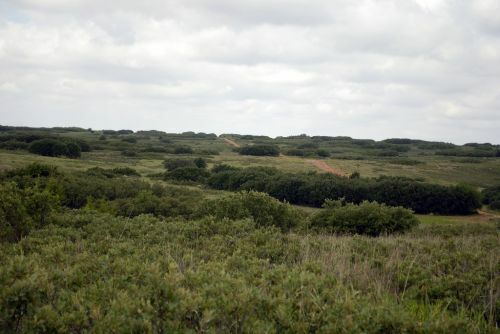 In fall 2013, 288 greenhouse-grown seaside alder tree seedlings were planted at the Oka’ Yanahli Preserve to research the requirements for establishment. Cassie Ehardt, University of Oklahoma masters student, is researching how a symbiotic relationship with a certain bacterium influences seedling and sapling survival. Additionally, she is studying the effect of a pre-planting disturbance (burning and clipping) on growth and persistence of the trees. 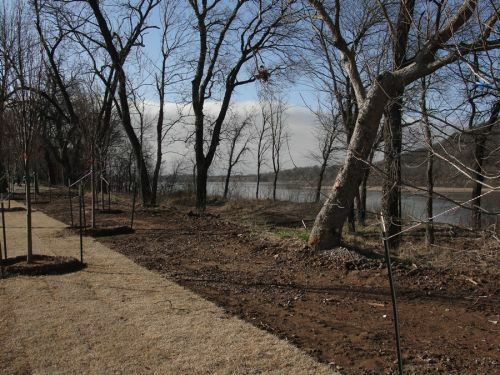 The Nature Conservancy, Chickasaw Nation, Inasmuch Foundation, The Pauline Dwyer Macklanburg and Robert A. Macklanburg, Jr. Foundation, Dolese Bros. Co., and Rudy & Deb Herrmann were each recognized with the “Team Builders Award” by Keep Oklahoma Beautiful for their partnership this past year on the Oka’ Yanahli Preserve! The Oka’ Yanahli Preserve was also honored as one of two sites in Oklahoma selected by the U.S. Department of Interior to be part of President Obama’s America’s Great Outdoors Program. The Blue River is on the cusp of the next generation of crucial water management decisions in Oklahoma. It is a critical source of water for the city of Durant. The partnership will allow the Conservancy to provide a template for restoration, sustainable use, education and protection. 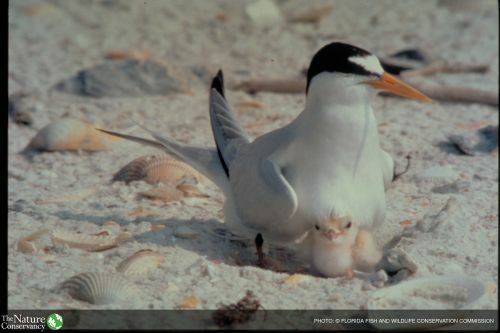 The federally endangered interior least tern (Sternula antillarum) is a small shorebird that nests on open sandbars along the Canadian and other major river systems of the central U.S. Adult terns feed on small fish and aquatic insects, and are often observed hovering above the water and diving after prey. Since the launch of the program in 2012, we completed a three-year monitoring plan on 15 streams at various Conservancy preserves. With the help of staff and volunteers, we collected aquatic data on the biology, water quality, hydrology, and geomorphology. This data will be utilized to refine conservation strategies and track conservation results in the future. The Canadian River and its floodplain encompasses the active river channel and immediately adjacent floodplain. Historically, the Canadian River was much broader, and was subjected to frequent scouring flows. Early surveys and aerial photography indicate a wide, braided sandy channel over 3/4 miles wide. At present, the river occupies a relatively narrow channel approximately 100 yards wide; flood events rarely occur. 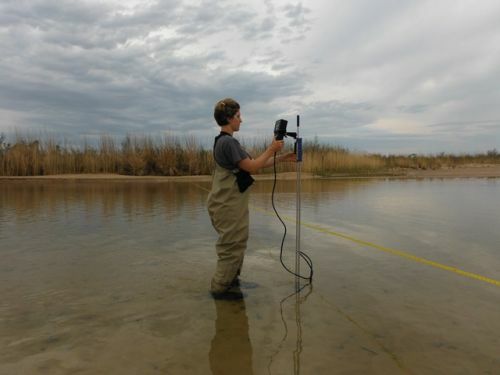 Though substantially reduced, the river supports viable populations of the federally endangered interior least tern and federally threatened Arkansas River shiner, as well as other species of conservation concern. The Canadian River rises in the foothills of the Rocky Mountains in southern Colorado and flows eastward 900 miles across New Mexico, Texas, and Oklahoma before merging with the Arkansas River. Over the millenia, this sandy, meandering river has carved an incised river valley with steep cliffs. The river's name is possibly derived from the Spanish term 'cañada', meaning glen or canyon. Of all 15 crane species in the world, sandhill cranes are the most numerous and wide-ranging. In North America, there are several recognized subspecies including two non-migratory populations that are each restricted to Mississippi and Florida. Scientists estimate that approximately 80 percent of all sandhill cranes in North America use a 75-mile stretch of Nebraska’s Platte River during spring migration. 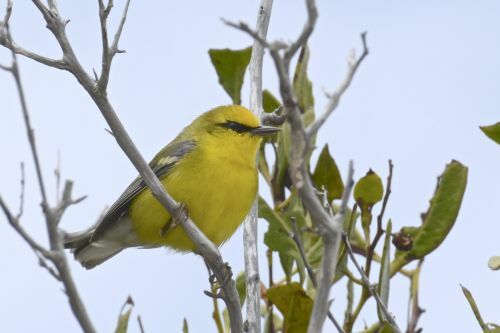 From March to April, more than 500,000 birds spend time in the area preparing for the long journey north to their breeding grounds in Canada and Alaska. During migration, the birds may fly as much as 400 miles in one day. The Arkansas River shiner (Notropis girardii) inhabits the shallow water of the Canadian and other tributaries of the Arkansas River system. This federally threatened fish spawns following heavy rains in summer, and its eggs develop as they are carried downstream. The Canadian River has undergone a dramatic change in the past 50 years. Construction of dams upstream has tamed the once powerful floods that occasionally scoured the river floodplain, narrowing the stream to approximately 10% of its historical width at the Four Canyon Preserve. 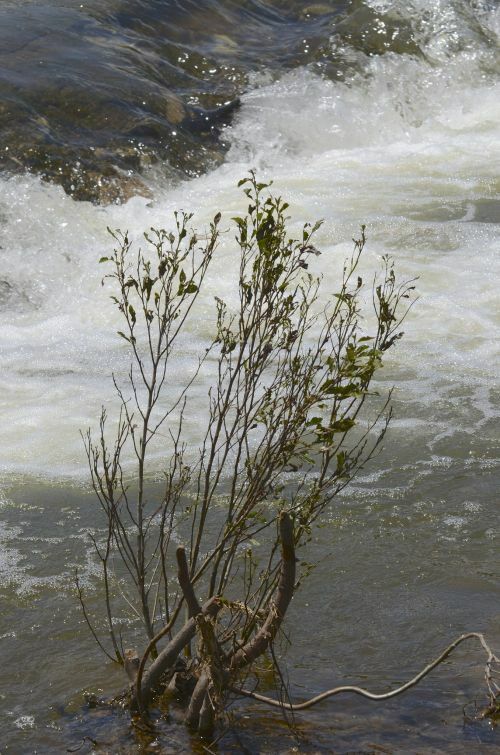 Without the periodic flooding, invasive shrubs such as saltcedar, russian olive, and eastern red cedar have become established along the length of the river valley. The Conservancy has implemented control programs aimed at reducing the impact of these plants in riparian habitats. Large numbers of sandhill cranes (Grus canadensis) travel through western Oklahoma during annual spring and fall migrations. Cranes and other waterbirds occasionally stop to rest and feed along the Canadian River during these long flights. 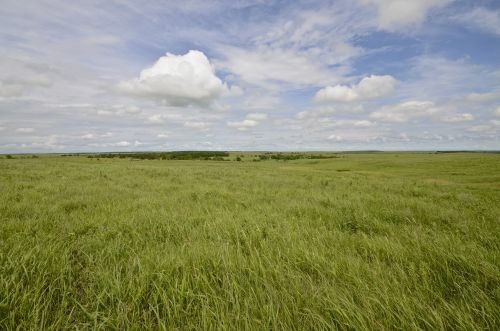 The Tallgrass Prairie Preserve is the largest, 39,000 acres, protected remnant of tallgrass prairie left on earth. Originally spanning portions of 14 states from Texas to Minnesota, urban sprawl and conversion to cropland have left less than 10% of this magnificent American landscape. 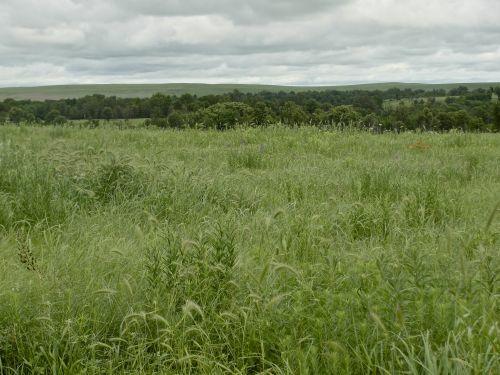 Since 1989, the Conservancy has proven successful at restoring this fully-functioning portion of the tallgrass prairie ecosystem with the use of about 2500 free-roaming bison and a "patch-burn" model approach to prescribed burning. What the Conservancy is doing now will offer conservation-minded ranchers an alternative to traditional grazing practices. Conservancy staff have already conducted several "patch-burn" workshops with area cattle ranchers to illustrate the potential rewards of embracing this wildlife-friendly method of land management, while continuing to meet the bottom line for their cattle production operations. In addition to alternative grazing practices, The Nature Conservancy is offering to hold conservation easements for land owners who would like to ensure the preservation of their property. More than three dozen research projects are active on the preserve, and over 78 publications in scientific journals have been produced. 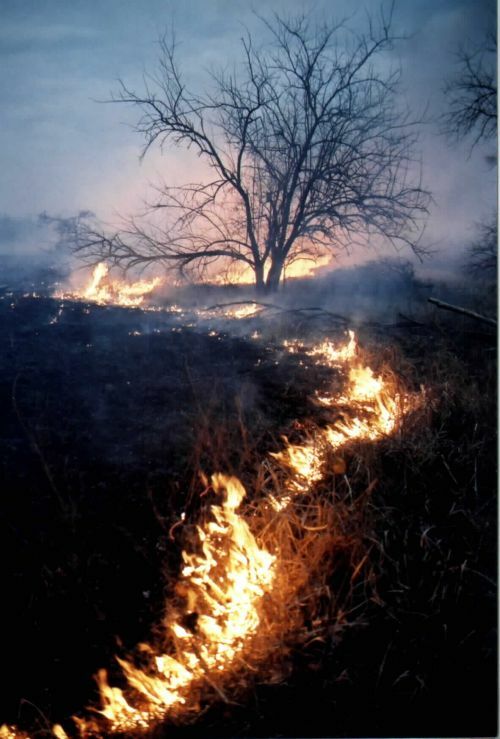 An exciting "patch-burn" was initiated with Oklahoma State University in 2001 on 7,300 acres. This study is testing the wildlife, plant community and cattle gains in patch-burn versus completely burned cattle pastures. The objective is to achieve similar conservation benefits as those documented in the fire-bison unit while retaining profit margin for cattle ranchers. 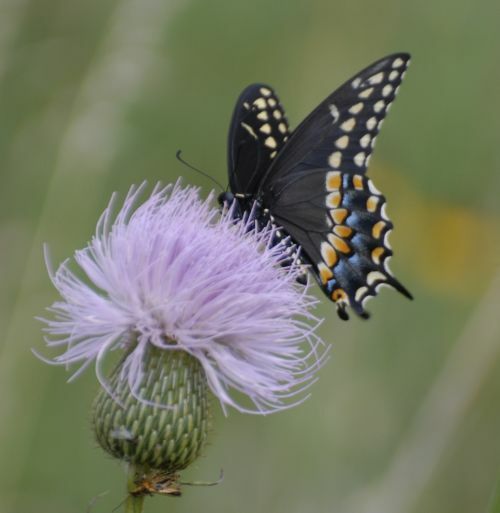 Tallgrass Prairie Preserve offers some excellent wildlife watching opportunities due to the variety of natural habitats. In addition to the more than 700 plant species on the preserve, more than 300 bird and 80 mammal species make the prairie their home. 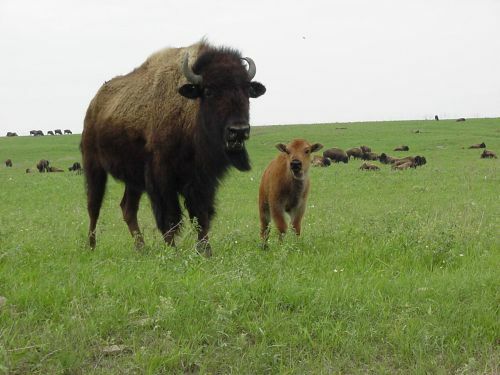 Visitors can experience the open prairie while viewing bison along the 10-mile driving loop. There are also patches of crosstimbers (upland native oak woodlands) along the route. 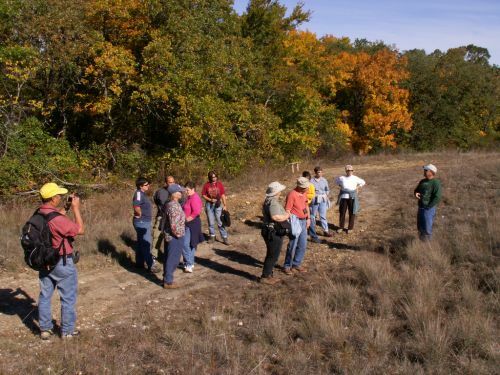 Designated hiking trails take visitors through bottomland forest, crosstimbers, and prairie. Plan your trip to the preserve today! 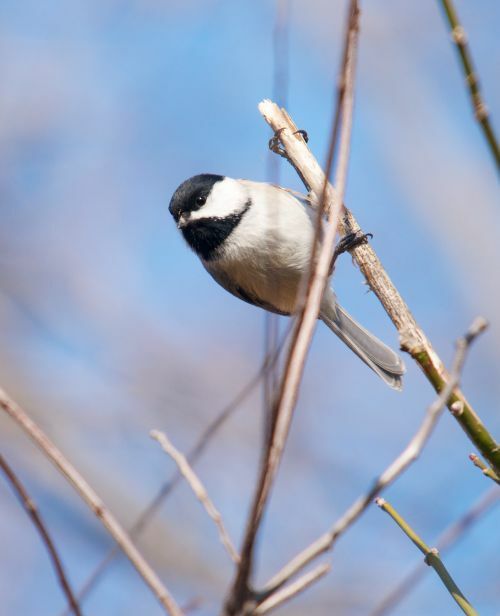 Narrow oak/cedar forests found along water courses in canyon areas provide habitat for wrens, chickadees, buntings, and other woodland birds in an otherwise treeless landscape. Gypsum is a soft greyish-white stone often found along the margins of canyons at the Four Canyon Preserve. Composed of calcium sulfate, this mineral is responsible for the bitter-tasting and 'hard' water of some streams and wells in western Oklahoma. A member of the white oak family, chinkapin oak is among the notable trees in riparian forests at the Four Canyon Preserve. Sheltered by steep canyon walls, these hardy oaks persist in an area otherwise inhospitable to eastern woodland plants. 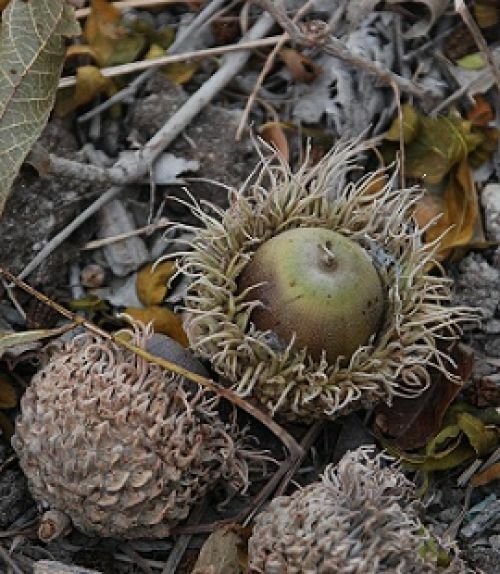 The palatable acorns of chinkapin oak are eaten by deer and other mammals. The stately cottonwood (Populus deltoides) is a found in riparian habitats throughout the Great Plains. 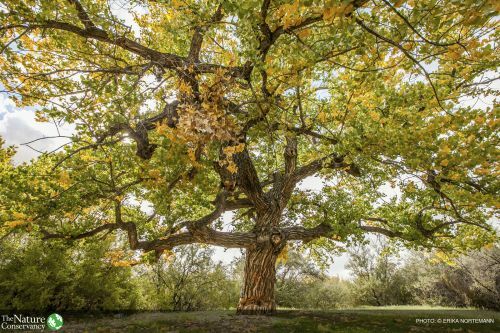 Among the largest trees at the Preserve, cottonwoods may grow to great size when found near springs and open water. Yucca plants occurs throughout the Great Plains and is common in many habitats at the Four Canyon Preserve. Its flowering stalks are highly palatable to grazing animals. And... did you know that there is a moth that cannot survive without the yucca plant and the yucca plant cannot survive without this moth? 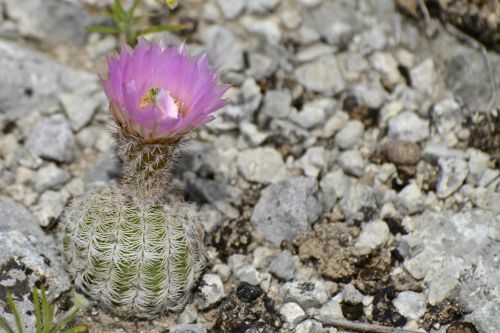 The cacti at Four Canyon Preserve are in bloom during the summer months. 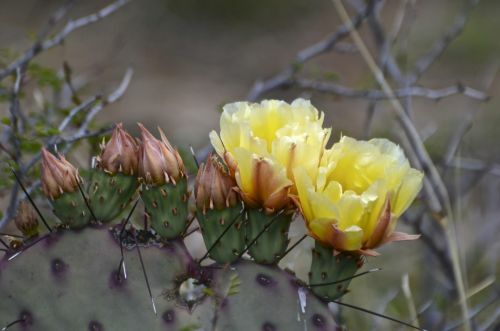 These prickly plants make way to a colorful array of flowers. 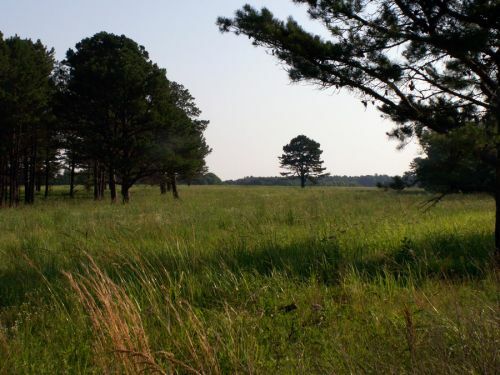 Pontotoc Ridge Preserve is premier Arbuckle Plains property located on top of the Arbuckle-Simpson Aquifer, providing critical recharge for the aquifer. This 2,900-acre landscape rests in south-central Oklahoma and holds bottomland forests, oak savannas (essential for migratory birds like painted buntings), mixed-grass and tallgrass prairies, springs and cool running streams. 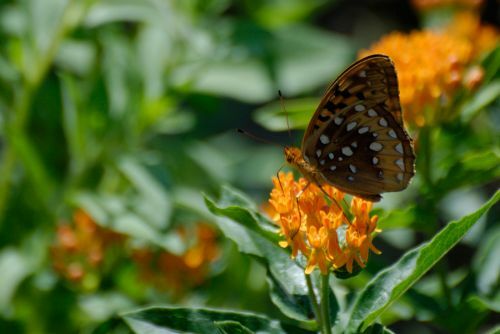 This untilled landscape has proven to be a regional hot spot of butterfly diversity, boasting over 90 species documented at the preserve to date. Whether it's cactus, bluestem or mountain boomers, Pontotoc Ridge Preserve is an excellent example of Oklahoma's ruggedly beautiful lands. The original property that formed the preserve was a gift from the Buddy Smith family. 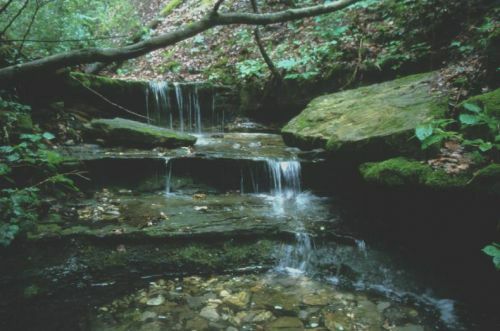 The Arbuckle Plains are covered with springs and caves with unique fauna, including the Oklahoma cave amphipod, an invertebrate known from only four caves, all of which are located in the Arbuckle Plains. The spring with the greatest abundance of amphipods is on the Pontotoc Ridge Preserve. 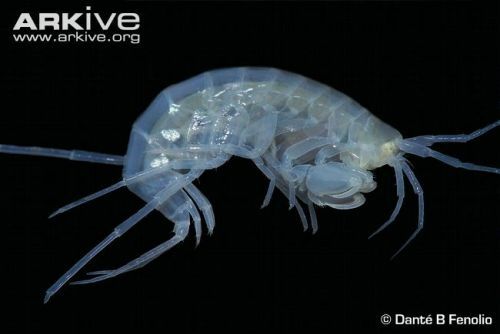 There are also numerous isopods, crickets, crayfish, other species in these caves and springs. 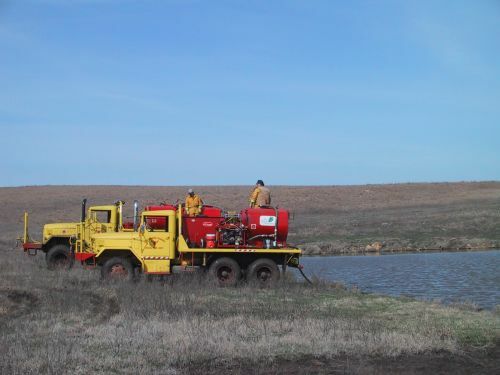 Along with an astonishing array of plants and wildlife, approximately 150,000 people in south-central Oklahoma depend on a healthy, sustainable Arbuckle-Simpson Aquifer as their resource for water. The Arbuckle-Simpson Aquifer plays a vital role in the well-being of human communities who depend on it for water, food, jobs and recreation. 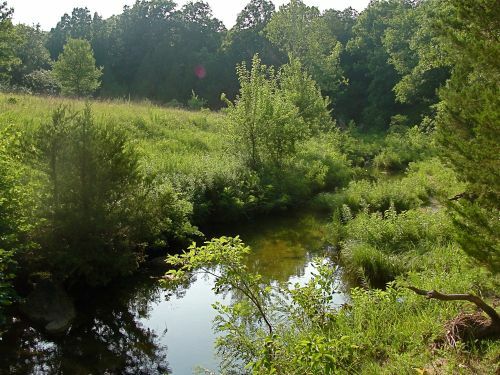 It provides drinking water to the local communities including Ada, Sulphur, Davis, Tishomingo, and Durant; water for agriculture and other industries; and exceptional recreational opportunities for hunters, anglers, and other outdoor enthusiasts. 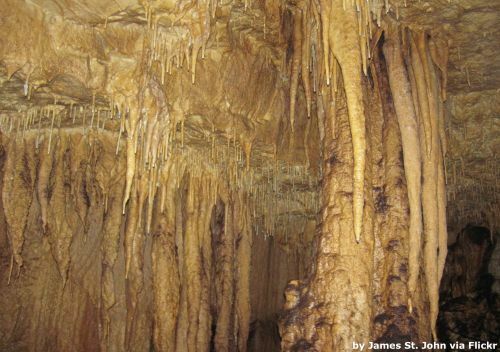 Caves are formed when rainwater containing carbonic acid erodes layers of soft limestone to form underground caverns. Seepage of water does not stop when the cave is formed. 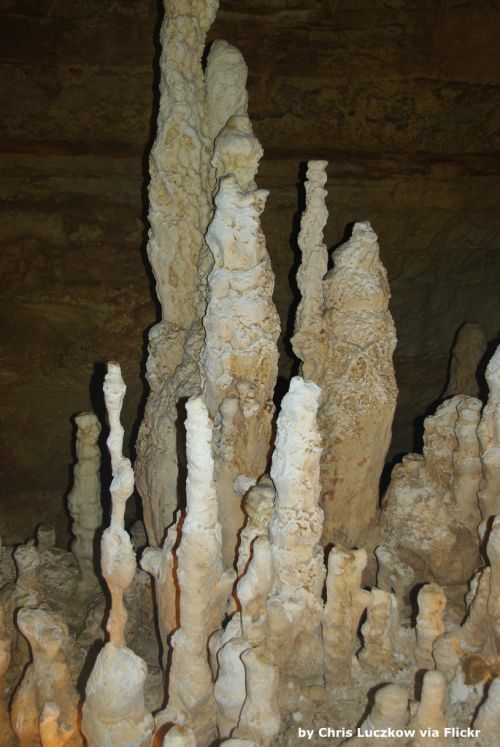 In most caves, the seepage will continue at a very slow rate forming rock structures called speleothems such as stalactites, calcite deposits that hang down from the ceiling, and stalagmites, calcite deposits that rise up from the floor. Visitors to the Tallgrass Prairie Preserve are encouraged to sign the guest register at the Gift Shop / Visitor Center. The Preserve receives about 20,000 visitors per year which usually represent all 50 United States and three to four dozen foreign countries. The Gift Shop / Visitor Center is open from March through mid-December from 10:00am to 4:00pm. It is usually open every day during that period and is staffed by trained volunteer docents. Chert rock is very abundant throughout this area and is one of the most abundant stones found in the Illinois River. As the river current decreases, sediments (Chert) fall out of the swift moving water producing chert gravel bars. Chert was used by the Native Americans to make tools, and hunting devices, (e.g. arrowheads, spear points, and knives). Unfortunately, the Nickel Preserve is subject to human trespass, irresponsibility, and the destruction of natural beauty. We must protect areas against this type of destruction by education others about the harm that is being done to the beautiful natural areas and protect them for the future. Sycamore trees (Plantanus occindentalis) are large riparian zone trees that help prevent stream bank erosion. Sycamores are considered to be one of the largest hardwood trees found in North America and have a very fast growth rate especially near wet areas. 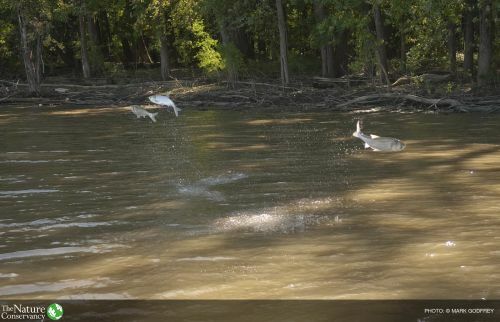 A carp is a bottom feeder fish and can be seen throughout the Illinois River usually in shallow water areas. Many different species of fish are found throughout the river, which provide outdoor enjoyment for fisherman. 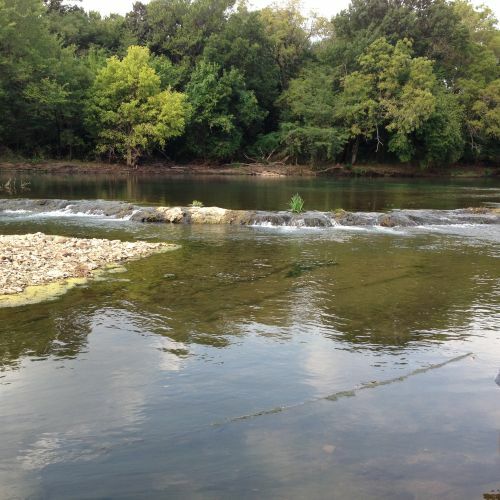 The Illinois River starts in northeast Arkansas and is fed by many freshwater springs. There are many opportunities for the public to visit and enjoy the river. As Oklahoma's scenic river, the river provides beautiful views along with the opportunity for the public to float the river. It is important to protect against stream bank erosion by planting riparian buffers and maintaining ground cover. This technique helps to keep sediment out of our streams, rivers, and lakes. Erosion control helps in water clarity and water quality. The Illinois River is home to diverse wildlife including the bald eagle (Haliaeetus leucocephalus). The bald eagle is one of North America's largest raptors, its wingspan stretching as wide as 8 feet.It lives on coasts, lakes and rivers from Alaska to Northern Mexico, migrating south in the winter only if necessary. One of eight fish eagles, its primary food source is fish, often stolen from other birds, but it also feeds on carrion, water fowl and small mammals. 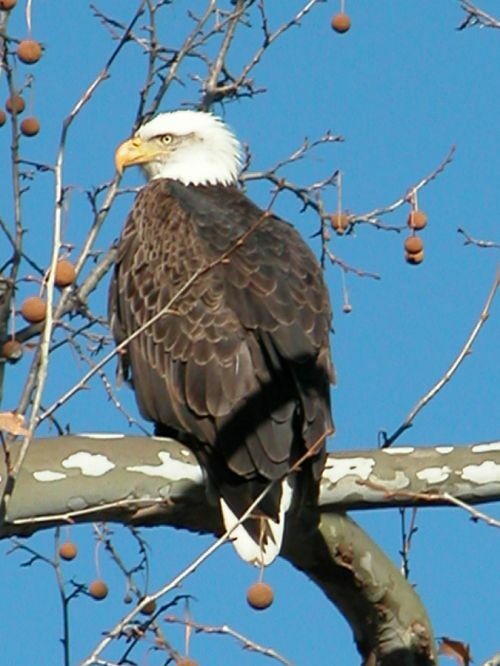 Learn more about the National Bird of the United States. 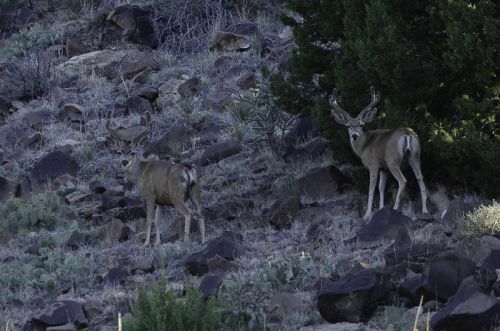 Mule deer (Odocoileus hemionus) inhabit the elevated terrain of breaks and canyons at the Four Canyon Preserve. "Mulies" possess large ears, forked antlers, and exhibit a characteristic behavior called "stotting" when alarmed by predators. Eastern red cedar (Juniperus virginiana) is a coniferous tree indigenous to the central and eastern U.S. 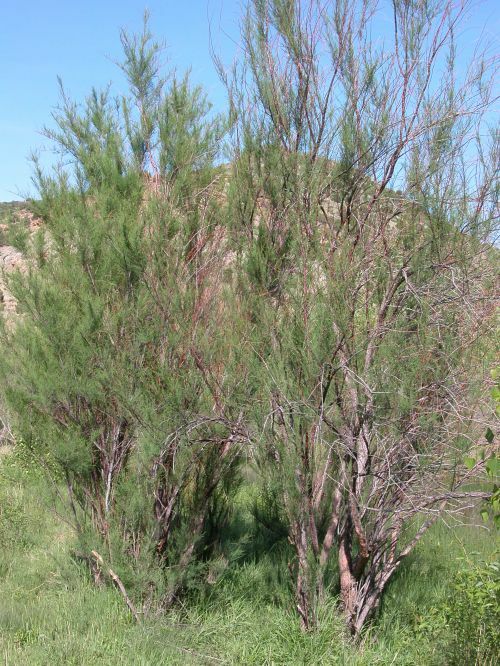 Historically, eastern red cedar was present at the Four Canyon Preserve along rock outcrops and other sites protected from fire, but was largely absent from upland areas. 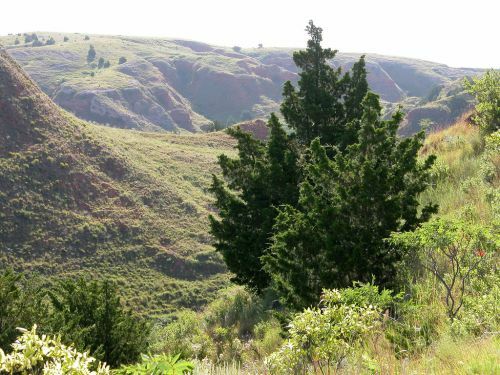 A vigourous invader, eastern red cedar has spread across hundreds of thousands of acres of prairie in Oklahoma in the decades since statehood, primarily a result of fire suppression. 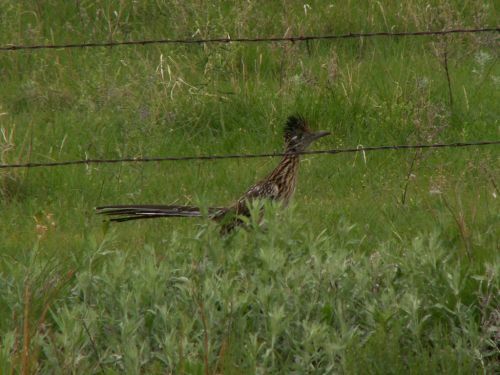 Since 2004, Conservancy staff have cleared approximately 2,400 acres of cedar timber from upland prairies on the property to improve nesting and brood rearing conditions for grassland birds. While often met with scorn, eastern red cedar in its "native" habitat (such as the canyon pictured) provides important food and cover to wildlife. Many small caves are found in gypsum outcrops along the margins of Cinnamon, Horse, and Harsha Canyons. A handful of these caves are large enough to be utilized by bats, such as cave myotis and western big-eared bats. 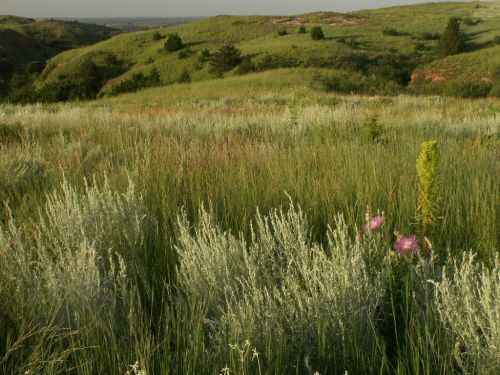 The Four Canyon Preserve is situated in a transitional area between the short and mixed-grass prairie ecotypes of the Great Plains. Plant community composition and structure varies with slope, aspect, and soil type across the property. Dominant plants of grassland areas include little bluestem, sideoats grama, blue grama, and buffalo grass. The grasslands in the northeastern portion of the Four Canyon Preserve provide habitat for the lesser prairie chicken, a species of grouse endemic to the southern Great Plains of North America. 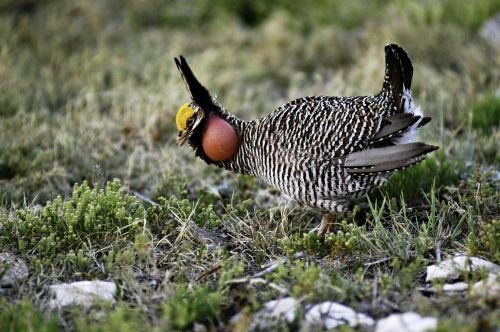 The lesser prairie chicken is a candidate for listing under the federal Endangered Species Act. 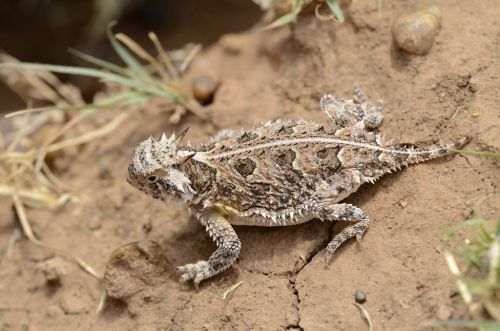 Formerly found throughout much of Texas and Oklahoma, the Texas horned lizard (Phrynosoma cornutum), or 'horny toad', has experienced a significant range reduction since the 1960s, and is now a species of conservation concern. Texas horned lizards remain common in relatively unfragmented grassland habitats in and around the Four Canyon Preserve. When in the midst of a drought, sometimes it is necessary to burn during at unusual times of the year. According to the preserve director, "from an ecological standpoint, there is no ‘wrong’ time of year to burn in the southern Great Plains. Fire is a natural process that, historically, would have happened year-round in Oklahoma. A lot of the Conservancy’s burning work is done in the springtime for practical reasons, but we do occasionally burn in other seasons. During droughts, it can be more difficult to control fires and in extreme cases, we may be subject to burn bans by state government. We squeezed this one in to avoid problems down the road." We are grateful to the individuals, businesses and organizations who generously contributed to the development of the headquarters building. Sculpted by Jocelyn Russell, 1/24/04. Inside the visitors' center, visitors will see photos taken of wildlife and scenic areas on the Nickel Preserve. 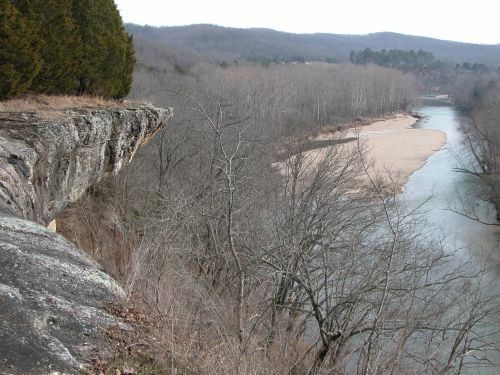 The J. T. Nickel Family Nature and Wildlife Preserve is the largest privately protected conservation area in the Ozarks. The preserve was formed in 2000 as the result of a land gift from the John Nickel Family. 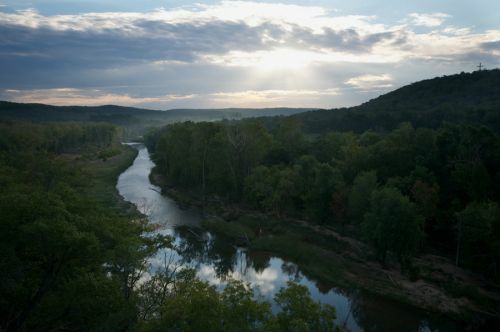 This 17,000-acre landscape rests in eastern Oklahoma's rolling Cookson Hills and overlooks the Illinois River. Learn more about the J.T. Nickel Family Nature and Wildlife Preserve. 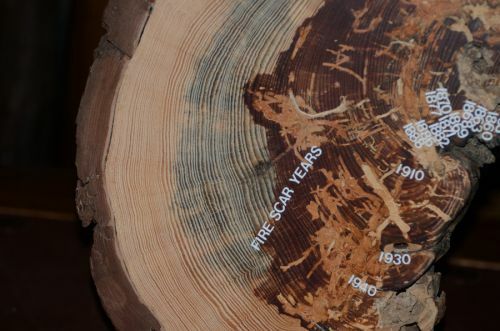 The Fire Scar study conducted by the University of Missouri shows the dates and frequency of past fire history on the Nickel Preserve. Some of the data dated back to the late 1600s. This study proved that fire was a large contributing factor in shaping the landscape in this area. Fire created an open woodland and savanna habitats for this area. These habitats enabled sunlight to reach the forest floor which gives more herbaceous plant species the opportunity to grow. After many years of fire suppression, the forest has become dense while many plant communities have become shaded out and covered up with leaf litter. 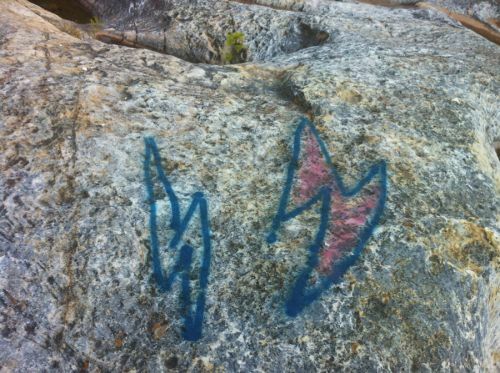 The fire study also gives us proof that Native Americans used fire frequently by comparing the dates of the fire with the arrival of Native Americans to the area. Native Americans also used fire as a tool through which they were able to find the plants they needed for food or medicines. Additionally, they learned that mammals reacted positively to fire. Many herbivores came to the recently burned areas in search of fresh vegetation for food. 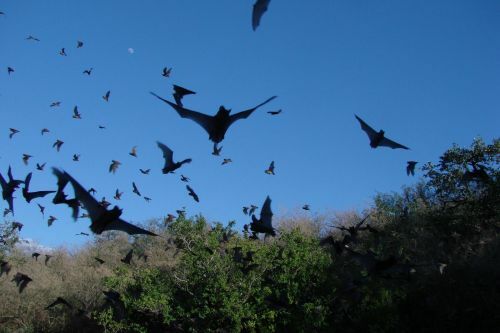 The increase in mammals allowed for better hunting. 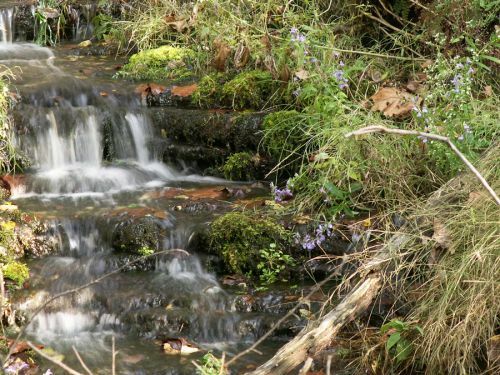 The Nickel Preserve is amidst the rolling Cookson Hills of Cherokee County and has historic springs and waterfalls revered by the Cherokee Tribe. The native american history lives on through this painting by L. Williams. This elderly oak (Quercus marcrocarpa) tree we’ve affectionately named "Itty" should be surrounded by a closed-canopy forest of similarly sized trees of many species. Historically, this was a bottomland hardwood forest where a squirrel could run for miles and never touch the ground. The forest was cleared for building materials, firewood, and to create open land to grow cotton and corn on in the rich bottomland soil that developed over many centuries under the forest floor, between the 1870s and 1940. Today, only Itty and a few large native pecan trees --which were saved because they provided a crop and food source-- are all that are left of that bottomland forest. In 1871 Oka' Yanahli was Tallgrass Prairie with thick forests along the river and streams. 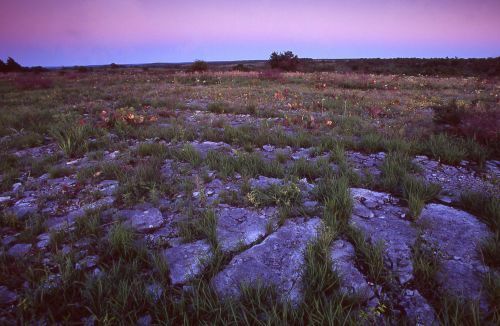 The underlying karst topography protected this prairie from plows. Still native prairie today, the Cantrell Brothers Ranch has been a working cattle ranch since bison were extirpated in the 1870’s. Settlers converted the land to bermuda grass for cattle grazing. The Nature Conservancy proposes to restore bison and fire to this landscape. 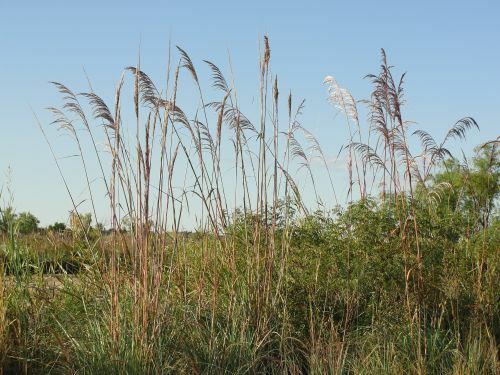 Removing cattle will also allow rivercane, the tallest of our native tall grasses, to flourish and spread across the bottomlands for the first time in over 100 years, improving the river’s resiliency and water quality. 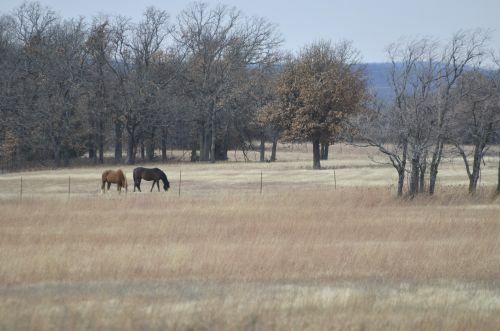 For the first time since Oklahoma began to be settled, the property is being managed to protect the aquifer and it’s springs, the Blue River and it’s bottomland forests, and the rolling prairie. The Nature Conservancy of Oklahoma invites you to enjoy the outdoors – and the places that you've helped us protect. From species surveys and volunteer workdays to hikes and educational presentations, there are many ways to both enjoy and support the work of The Nature Conservancy. Many preserves like Oka' Yanahli are not typically open to the public, so these field trips are unique opportunities to come visit these last great places. Check back often for upcoming events. 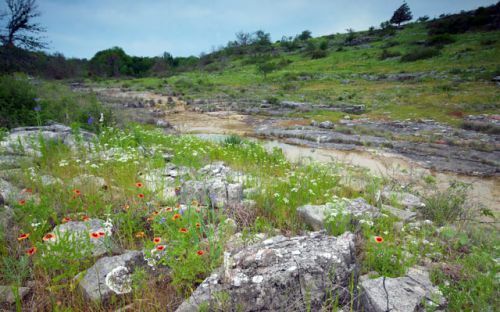 The terrestrial communities that make up the Arbuckle Plains are a mixture of Crosstimbers, prairie and limestone outcrop communities, with bottomland hardwood forest along the streams. These communities evolved within a pattern of frequent and widespread fire. Prior to the relocation of Native American tribes to Oklahoma in the 1830s and statehood, the region had a history of frequent fire. In addition to lightning- set fires that most often burned in the spring and sum- mer, the indigenous Plains Indians were known to have set fires each autumn. 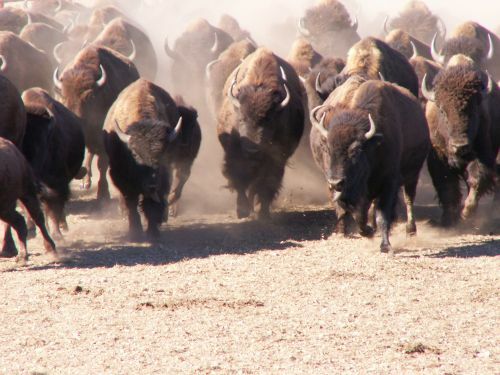 Fires were set to improve forage for bison and other wildlife, to drive bison herds, increase visibility for hunting & protection, increase plant diversity for foods & medicines, and many other uses. Fire is a key component of healthy ecosystems. The Preserve Headquarters complex is supplied with water from a natural spring located 1 mile north. A gravity-fed pipeline delivers the water to the well house, and from there it is treated and pressurized. 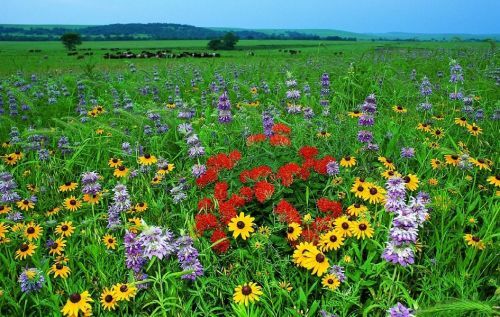 The Tallgrass Prairie Preserve consists of just under 40,000 acres, covering roughly 62 square miles. There are about 20 miles of public county roads within the preserve, with five scenic turnouts. 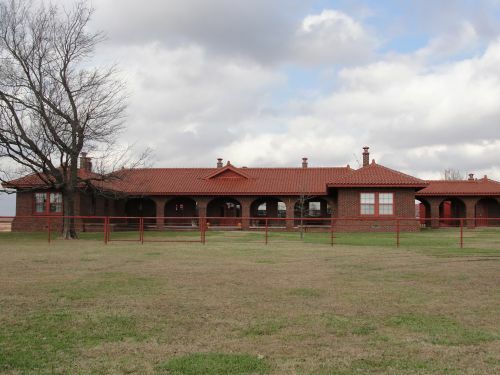 The Historic Bunkhouse was built in 1919-1920 as the headquarters for the Chapman-Barnard Ranch, which once covered more than 100,000 acres. The Bunkhouse has been restored to its original condition by The Nature Conservancy, and is listed on the National Registry of Historic Places. Learn more about the Historic Bunkhouse. Separate men\'s and women\'s public restrooms are attached to the Bunkhouse, and available for use at all hours. Commonly referred to as the Shop, this building is where the cowboys meet on a daily basis. It contains everything they need to make the daily operations of the Preserve run smoothly. When the Preserve was still an active cattle ranch, this is where the cowboys would shoe, stall, and train their horses. When time permitted, they would also practice their roping skills in the adjacent pens. 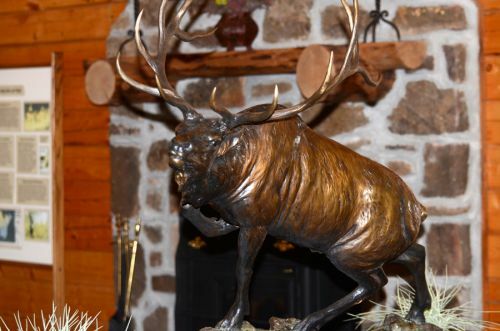 The bronze sculpture is titled "Change of Seasons" and was created by T.D. Kelsey. 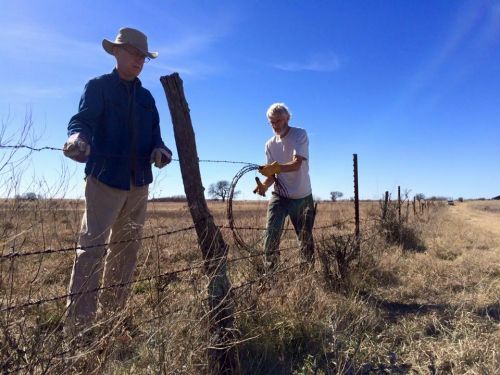 William and Joffa Kerr dontated the sculpture to the Tallgrass Prairie Preserve in November of 2009. Bring your lunch to this wonderful picnic spot near the Headquarters complex. This site offers half a dozen picnic tables under the shade of some huge black walnut trees near Sand Creek. 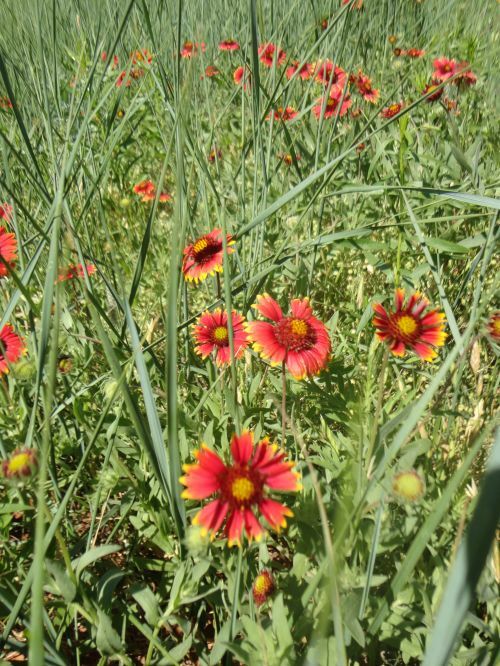 "Crosstimbers" is the plant community name used to describe this native prairie-woodland mix. Post oaks and blackjack oaks are the tree species that can persist on these coarse, sandy soils. The frequency and intensity of fire is what largely determines if a crosstimbers site will be a savannah with a few trees in prairie (foreground), or a closed-canopy forest (distant horizon). The Preserve hosts a wide diversity of birds, with grassland species being of particular concern due to their regional decline in the past few decades. 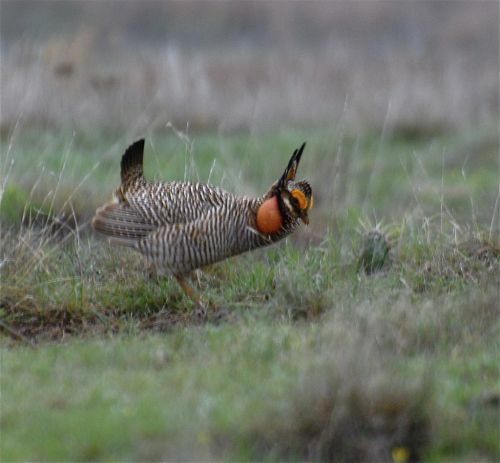 Greater Prairie Chickens are the iconic grassland bird of this prairie. 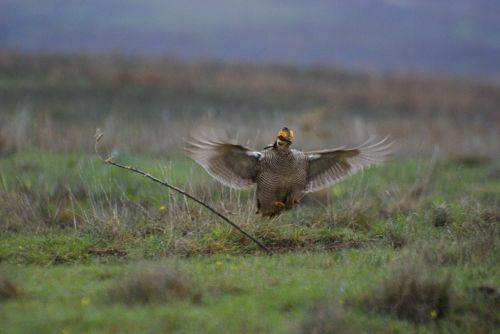 Listen and watch for their "booming" displays during the spring breeding season. 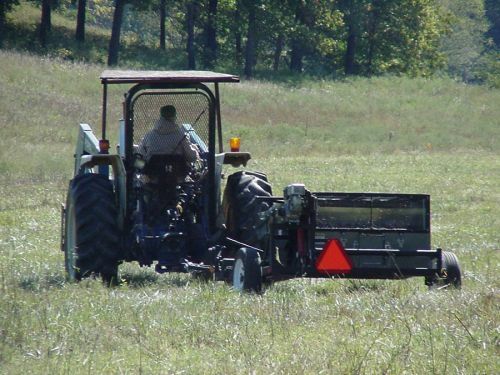 The hiking trails are mowed and maintained to provide a safe and enjoyable experience of the Tallgrass Prairie Preserve. Benches and siting boulders are scattered along the trails. The hiking trails are open to the public throughout the year. The trail system consists of three interconnected loops of 1/2 mile, 1 mile, and 2 miles. Self-guided trail brochures are available in the kiosk at the trail head parking lot. Come and enjoy a leisurely stroll through the prairie! The trail area is exclude from grazing and is solely maintained with prescribed fire. 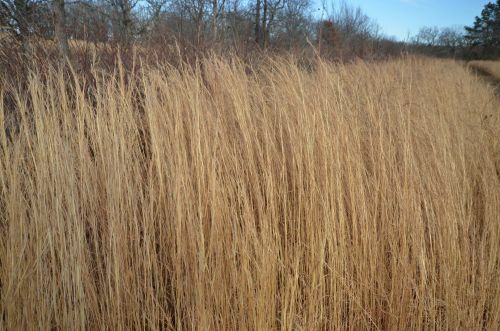 This area is where you can usually find big bluestem growing to a height of over 6 feet! 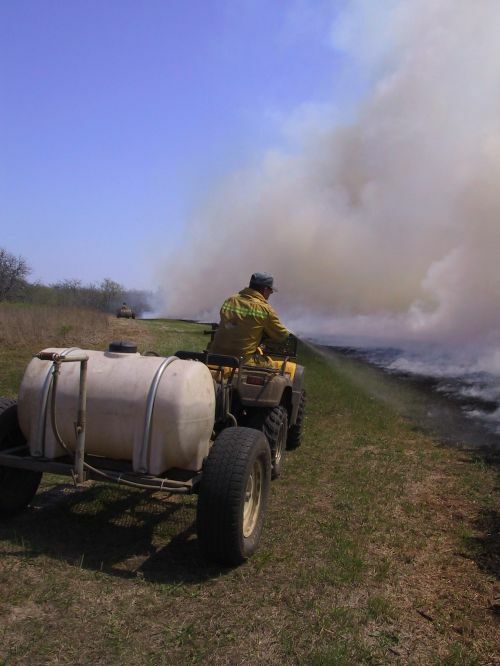 Learn more about fire-only managed prairie. 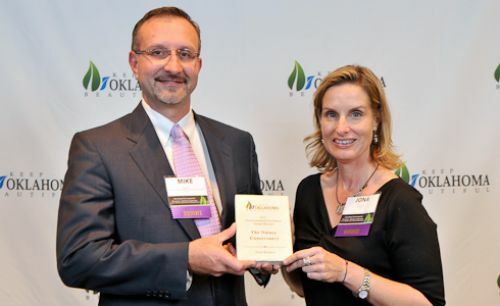 The Oklahoma Chapter of The Nature Conservancy was initiated in 1986. 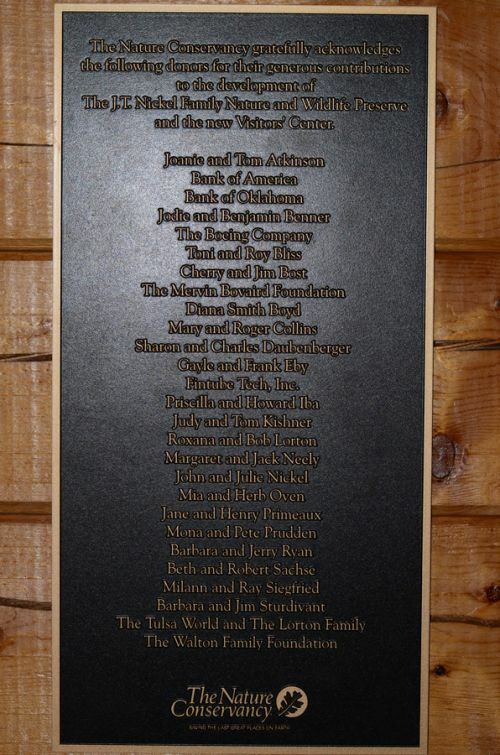 The 12 Founding Board members are honored at this monument on the Prairie Earth hiking trail. The bison live on The Nature Conservancy’s Tallgrass Prairie Preserve — the largest protected tallgrass prairie remnant left in the world. The Conservancy reintroduced 300 bison (which eat almost entirely grass) here in 1993 to help restore the 39,000-acre preserve's balance between grasses and broadleaf plants. Now, the entire herd is rounded up every fall by staff and local wranglers for a "check-up" — which includes a weigh-in and vaccinations. 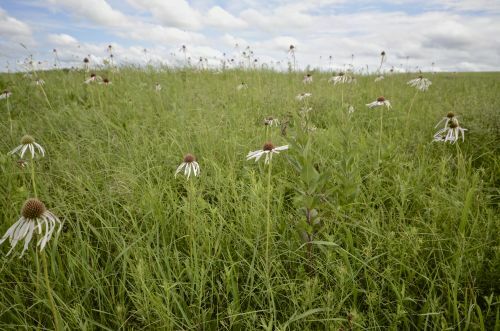 Tallgrass prairie is made up of many different species of grasses, forbs, and shrubs but there are four iconic species that define the tallgrass prairie. These species are big bluestem, little bluestem, Indiangrass, and switch grass, and they can be found throughout the Preserve. Controlled burning is an important management tool for our staff. Many plants and animals in all of Oklahoma’s different terrestrial habitat types require fairly frequent fire. Conservancy staff and contractors undergo the same training and follow the same standards as federal wildland fire agencies. 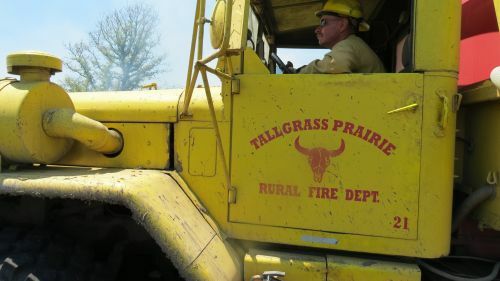 Our top-notch burn team is lead by award-winning Bob Hamilton, Director of the Tallgrass Prairie Preserve. Bob manages a statewide fire program with support from Chris Hise, Burn Boss; Leroy Alm; Joe Bob Briggs; Tony Brown; Kevin Chouteau; Perry Collins; Steve McGuffin; Jay Pruett; Jeremy Tubbs; Jona Tucker; and Matthew Webb. Hats off to the Oklahoma fire crew for another successful year in maintaining fire’s natural role. 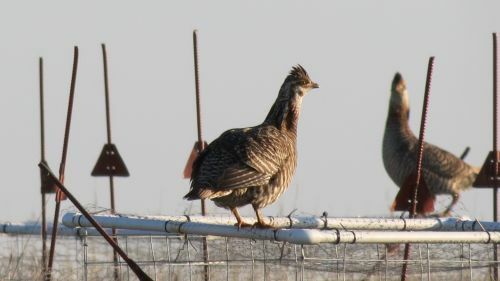 With its uniformly barred plumage, the greater prairie chicken is nearly identical to the lesser prairie chicken, though slightly darker and, aptly enough, larger. In summer, the bird feeds mostly on insects, seeds and fruits. It hides its nests in tall, dense grass, laying 7 to 17 eggs, which the female incubates for 23 to 26 days. Females typically lead hatchlings to shorter grass, also the scene of elaborate mating rituals in which males drum their feet in stylized dances and make a booming call that can be heard for over a mile. The open courtship areas are known as “leks” or “booming grounds,” and the courtship displays are the species’ most famous trait. The Greater Prairie Chicken is threatened by habitat loss and loss of genetic variance resulting from the isolation of populations. The Conservancy's Four Canyon Preserve encompasses 4,000 acres of mixed-grass prairie, rugged canyons, and floodplain along the Canadian River in southern Ellis County. Scenic prairie ridges traverse the landscape, dissected by deep chinquapin oak-lined canyons draining to the river. 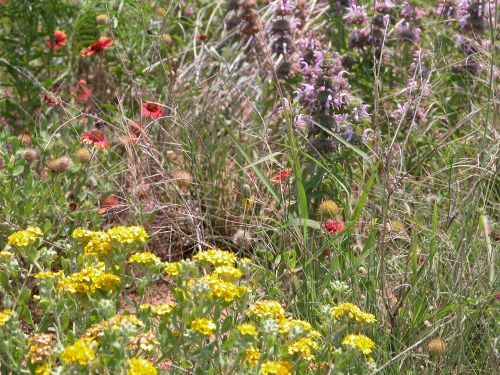 These prairies provide habitat for a number of rare grassland birds, such as Cassin's sparrow and Swainson's hawk, and additional species of concern including reptiles like the Texas horned lizard, as well as numerous state-rare plants. The cool, wooded canyons stand in contrast to the surrounding prairies, and provide habitat for birds like red-bellied woodpecker and painted bunting. The Canadian River on the preserve provides habitat for the federally endangered least tern, the threatened Arkansas River shiner, as well as stopover habitat for migratory shorebirds including the sandhill crane. 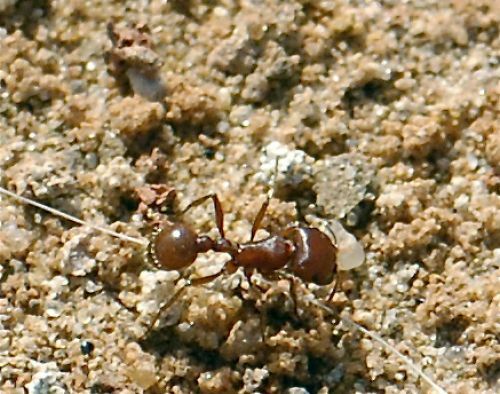 Seed harvester ants build large underground nests or 'beds' in areas of exposed soil. Colonies may include many thousands of workers who attend a single queen, and can persist in the same area for decades. Harvester ants are the primary prey of Texas horned lizards, a species of concern in Oklahoma and Texas. 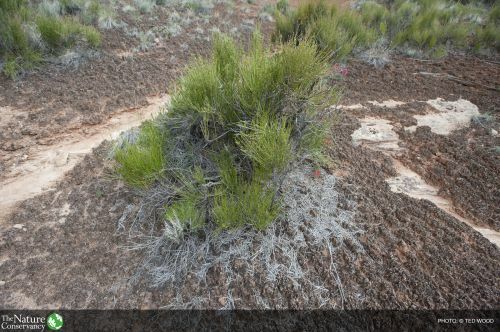 Sand sage or sagebrush (Artemesia fillifolia) is a perennial shrub native to the Great Plains and Great Basin regions of the U.S. An indicator of sandy soil, sand sage helps to stabilize areas prone to wind erosion and provides cover for small mammals and birds. 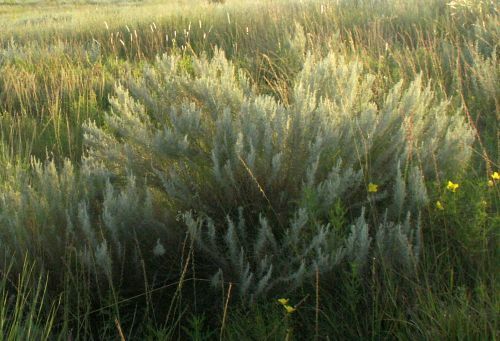 The characteristic smell of sagebrush is associated with the American West of popular culture. The Nature Conservancy of Oklahoma invites you to enjoy the outdoors – and the places that you've helped us protect. From species surveys and volunteer workdays to hikes and educational presentations, there are many ways to both enjoy and support the work of The Nature Conservancy. Though Four Canyon Preserve is typically not open to the public, these field trips offered in both the spring and the fall provide a unique opportunity to come visit the preserve. Check back often for upcoming events. Unlike its well-known cartoon representation, the roadrunner does not go “beep beep,” though it is eaten by coyotes. Mostly a bird of the American southwest, it lives in deserts, grasslands, and woodlands from Missouri to Mexico. It averages about 20 inches in length and 19 inches in wingspan, though it rarely flies, preferring to run at speeds as fast as 18 miles per hour. In the higher elevations of the Four Canyon Preserve, reddish Permian-age sandstones are capped by the lighter colored sand & gravel of the Ogallala geologic formation. Differences in texture and composition of these soils contributes to the remarkable diversity of plant communities found on the property. The distinct boundary between the two features is known locally as the Ogallala/Permian ecotone. Shinnery oak (Quercus havardii) is a low growing shrub found in sandy areas of the southern Great Plains. This interesting plant reproduces exclusively by underground stems, and individual 'clones' may live for many thousands of years. Well-managed shinnery provides excellent habitat for lesser prairie chickens and other grassland birds. The name is derived from 'chêniére', a French term for oak. 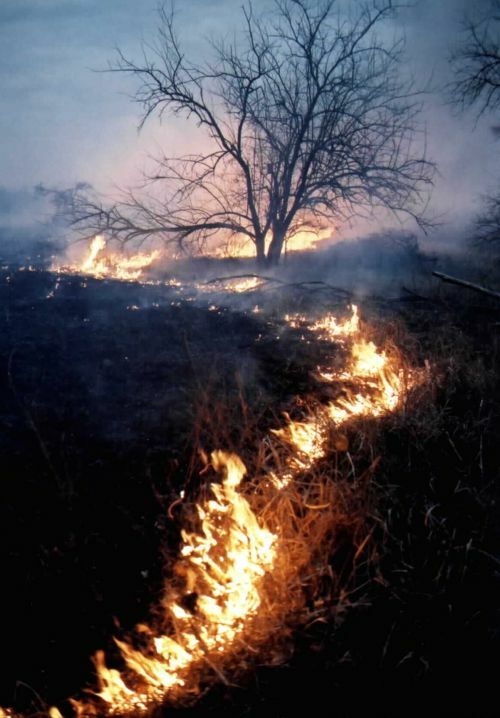 Fire is a critically important natural process in many grassland ecosystems around the world. 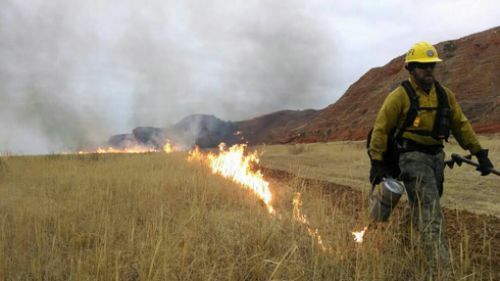 At the Four Canyon Preserve, carefully planned 'prescribed' fires are used to control the growth of invasive woody plants, rejuvenate prairie grasses, and improve habitat conditions for a broad suite of wildlife species. The white 'skeletons' of dead eastern redcedar trees visible in the photo are the result of prescribed burns and wildfires that occurred in 2005 and 2008. The firewheel (Gaillardia pulchella) or 'indian blanket' is the state wildlflower of Oklahoma. 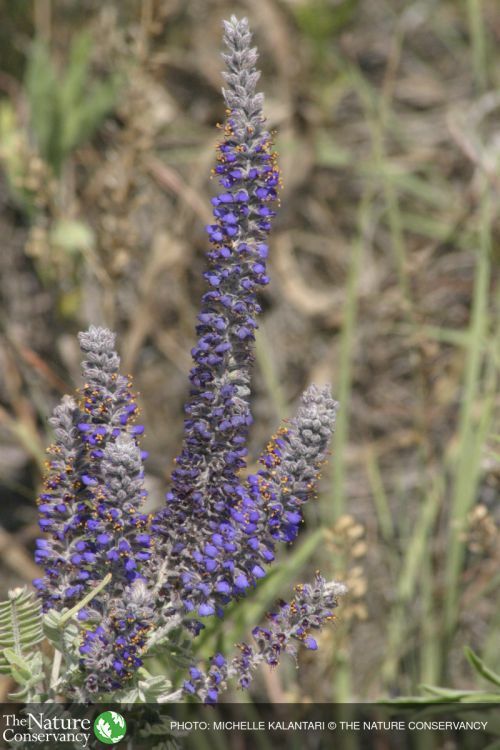 This hardy annual plant is common in shallow soil areas of the Four Canyon Preserve. 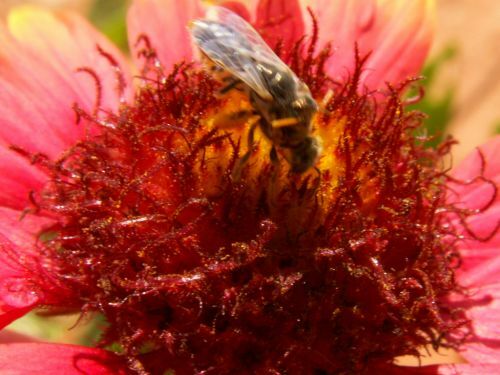 The scientific name translates as 'beautiful gaillardia'. 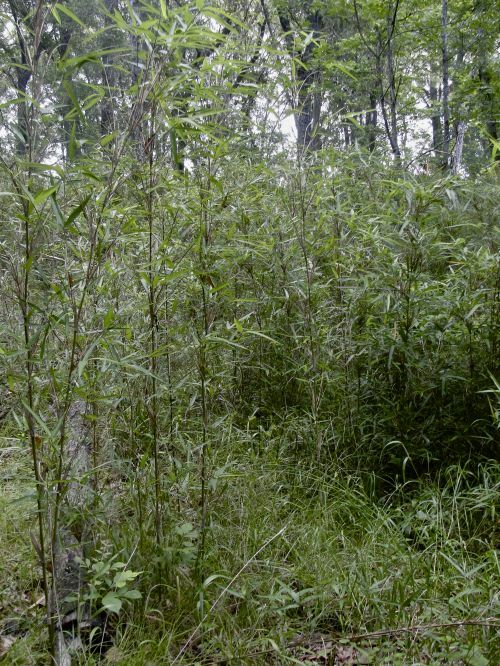 River cane (Arundinaria gigantea) is the only temperate bamboo in North America. The genus is native to the eastern United States from New Jersey south to Florida and west to Ohio and Texas. Within this region they are found from the Coastal Plain to medium elevations in the Appalachian Mountains. Its members have running rhizomes and are woody and tree-like, attaining heights from 0.5 up to 8 metres (1.5 to 26 feet). They produce seeds only rarely and usually reproduce vegetatively, forming large genets. When seed production does occur, the colony usually dies afterwards. Among the distinctive features of the canes is a fan-like cluster of leaves at the top of new stems called a top knot. River cane has historically been used to construct Native American flutes, particularly among tribes of the Eastern Woodlands. 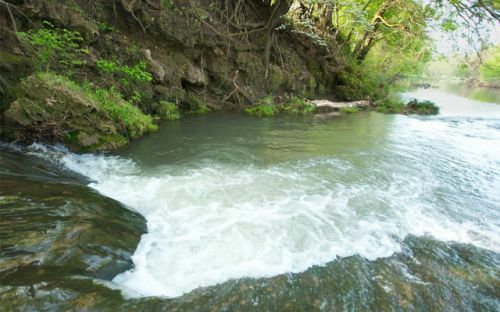 The name is Oka’ Yanahli (oh-kuh yuh-naw-lee) means water flowing in Chickasaw. “We are honored that The Nature Conservancy chose to embrace Chickasaw heritage by choosing this name for the preserve,” said Bill Anoatubby, Governor of the Chickasaw Nation. “Chickasaw people have recognized the beauty and significance of the Blue River for more than 160 years. We are pleased to work with The Nature Conservancy to preserve this beautiful Oka’ Yanahli for generations to come.” Inaugural partners who made the purchase of this preserve possible include the Chickasaw Nation, Inasmuch Foundation, The Pauline Dwyer Macklanburg and Robert A. Macklanburg, Jr. Foundation, Dolese Bros. Co., and Rudy & Deb Herrmann. 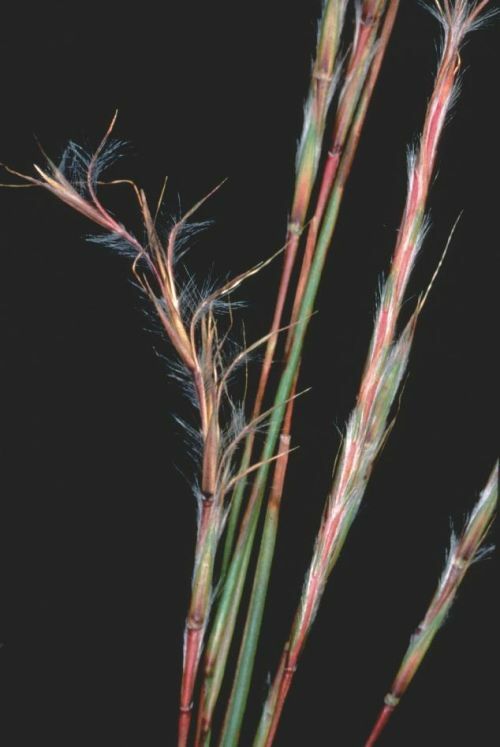 Old World bluestem (Bothriochloa ischaemum) is an exotic bunchgrass that was widely planted in Oklahoma and Texas for pasture and erosion control in the 20th century. A native of central Asia, this grass has proven to be particularly invasive in the southern Great Plains of North America. It invades all stages of plant succession, altering the species composition and habitat structure of native prairie communities. Though it was never intentionally planted on site, scattered populations of Old World bluestem occur across the Four Canyon Preserve in disturbed areas such as roadsides. 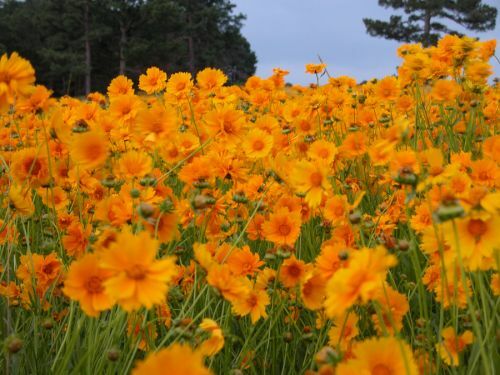 Four Canyon Preserve boasts beautiful wildflowers that are in full bloom in the summer season. The Texas horned lizard or "horny toad" is a flat-bodied and fierce-looking lizard. The head has numerous horns, all of which are prominent, with two central head spines being much longer than any of the others. This lizard is brownish with two rows of fringed scales along each side of the body. 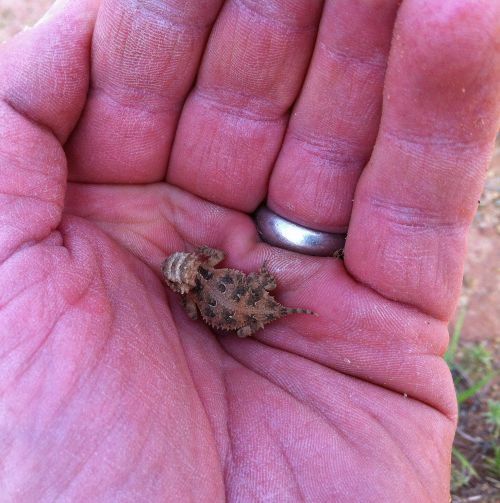 On most Texas horned lizards, a light line can be seen extending from its head down the middle of its back. It is the only species of horned lizard to have dark brown stripes that radiate downward from the eyes and across the top of the head. They can be found in arid and semiarid habitats in open areas with sparse plant cover. Because horned lizards dig for hibernation, nesting and insulation purposes, they commonly are found in loose sand or loamy soils. Texas horned lizards range from the south-central United States to northern Mexico, throughout much of Texas, Oklahoma, Kansas and New Mexico. The collared lizard (Crotaphytus collaris) or 'mountain boomer' is a common sight among rock outcrops at the Four Canyon Preserve. These large, colorful lizards may reach 16" in length and are a favorite of visitors. The collared lizard is the state reptile of Oklahoma. 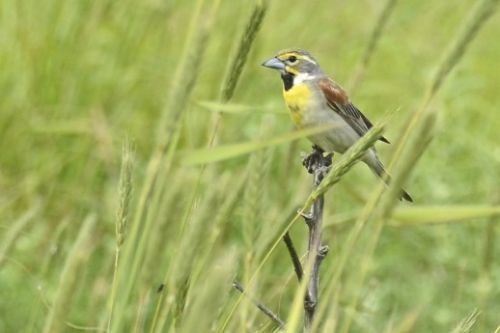 Over the past several decades, grassland birds have experienced more significant population declines than any other group of birds in North America. The protection of large, unfragmented habitats such as the Four Canyon Preserve is critically important to ensure the long-term survival of these species. In arid areas of the world, biological soil crusts or 'cryptobiotic soils' form an important component of the land cover. These complex associations of lichens, fungi, and cyanobacteria play a key role in protecting fragile areas from erosion. The large and dense timber along Sand Creek provides valuable habitat for woodland birds. The Pileated Woodpecker is a real eye-catcher, with its Woody Woodpecker red crest. These large birds require large trees for excavation of their cavity nests. The woodland and savanna portions of the Crosstimbers are mainly post oak and blackjack oak on coarse sandy soils. 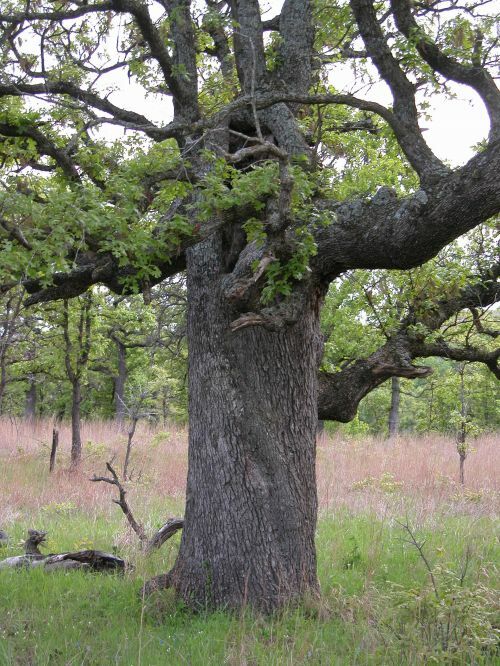 The short, stout oaks that grow in the Crosstimbers were of little commercial value, so those sites that were not cleared for farmland constitute one of the least disturbed "old growth" forests in the U.S. Post oaks have been aged to 300 years on the Preserve. Riparian vegetation consists of an assortment of different plants. These plants are typically emergent aquatic plants, or herbs, trees and shrubs that thrive in the proximity of water. Some of the largest and oldest trees on the preserve can be found along Sand Creek. A few of these trees have been aged back to the 1700s. 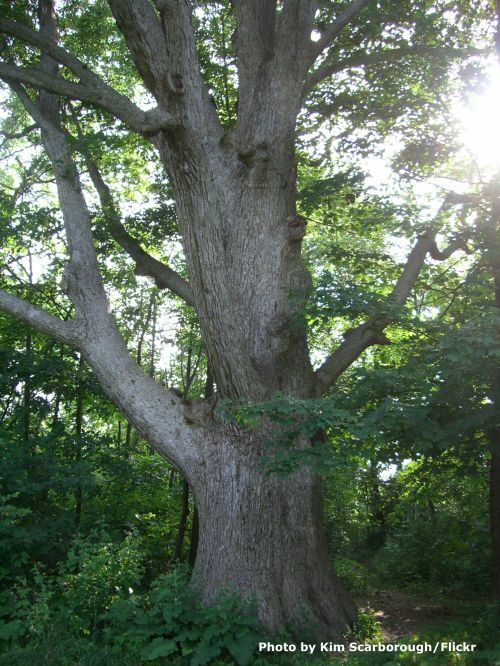 A few examples of the large species are bur oak, Shumard's oak, black walnut, and pecan trees. 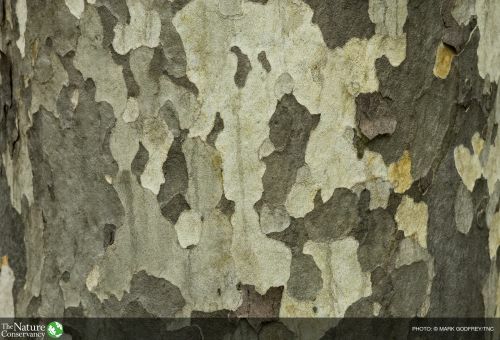 An American sycamore tree can often be easily distinguished from other trees by its mottled exfoliating bark, which flakes off in great irregular masses, leaving the surface mottled, and greenish-white, gray and brown. Sand Creek is ideal habitat for many different species of Oklahoma fishes. Twenty three species of fish have been cataloged thus far, including gar, catfish, largemouth bass, orange-throated darters, and five species of sunfish. Sand Creek is the largest prairie stream that traverses the Preserve. It crosses from the northwest to the southeast through which bison have miles of stream access. Sand Creek also drains serveral other smaller prairie streams including Wild Hog Creek, Dry Creek, and Mud Creek. American Bullfrog (Rana catesbeiana) is the largest frog in Oklahoma. Their food cosists of insects, frogs, crawfish reptiles, mice and even birds. A sigle female can lay up to 40,000 eggs. 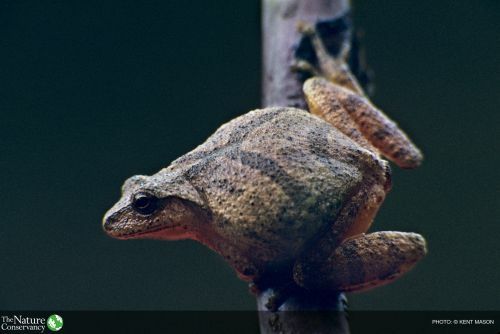 Northern Spring Peeper (Pseudacris crucifer crucifer) is a small frog that has a distinct high-pitched series of calls, \"peep\" \"peep\" \"peep\"! This frog is nocturnal. The males call from the safety of their cover in early spring. Central Newt (Notophthalmus viridescens louisianensis) This salamander starts its life in the water as an egg. As the aquatic larvae matures it transforms into a land-dwelling efts. After a few years the efts return to the water becoming semi-aquatic adults where they to lay their eggs. Elk (Cervus canadensis) Bull elk make vocal calls known as bugling during the breeding season (Sept-Nov) to attact females. Feral hogs do a tremendous amount of damage to the landscape and the environment. This muddy wallow is from feral hogs. They use these wallows to cool themselves and to remove parasites from their body. 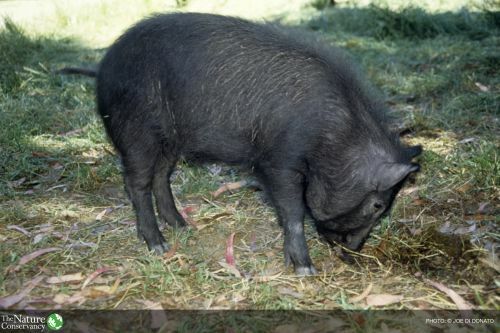 Feral hogs are an invasive species, so techniques are used by Nickel staff to control the population. 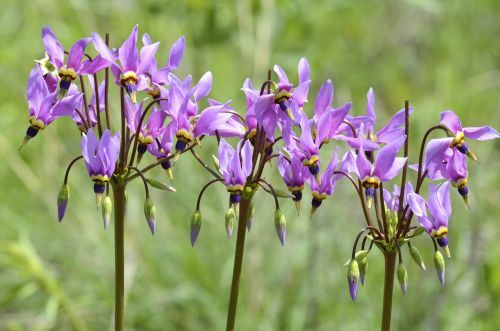 The odd-shaped flowers of Dodecatheon meadia hold on to their pollen making it difficult to obtain. Queen bumblebees will visit and obtain pollen from the flowers using ‘buzz pollination’ where the bees rapidly vibrate their thoracic muscles. Other bees visiting the flowers are Anthophorine bees, Eucerine Miner bees, and Green Metallic bees to collect pollen and fertilize the plant as the flower has no nectar. The seeds are too small to be of interest to birds, and the plant is said to be deerproof although other critters may feed on the foliage or use the foliage as cover. 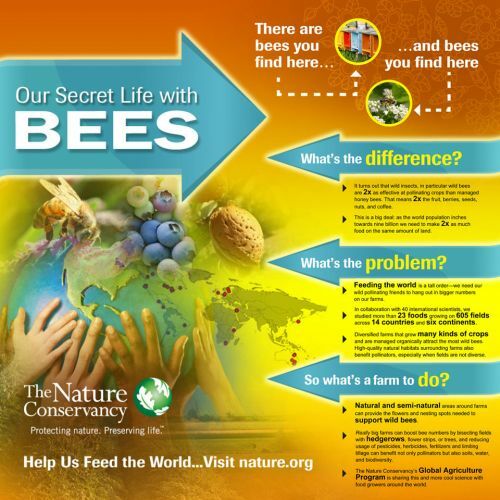 You’ve probably heard about the problems facing honey bees across North America, as hives disappear in the face of “colony collapse disorder.” You also undoubtedly know that this loss of pollinators could have severe impacts on food production. But you may not know this: honey bees get the press, but they’re not the only pollinator in trouble. In fact, native bumble bees have been facing even more alarming declines across the continent. This loss of bumble bees could have severe consequences for native ecosystems and for agriculture. Bumble bees are perhaps the most charismatic of all bee species: they’re fuzzy, colorful and non-aggressive. They’re also vital pollinators – more important to ecosystems than the non-native honey bee. Fifty species of North American bumble bees pollinate native plants, which in turn produce flowers and seeds that feed everything from songbirds to grizzly bears. Because of the wide variety of native plants and wildflowers, Pontotoc Ridge Preserve is an incredible habitat for bees. 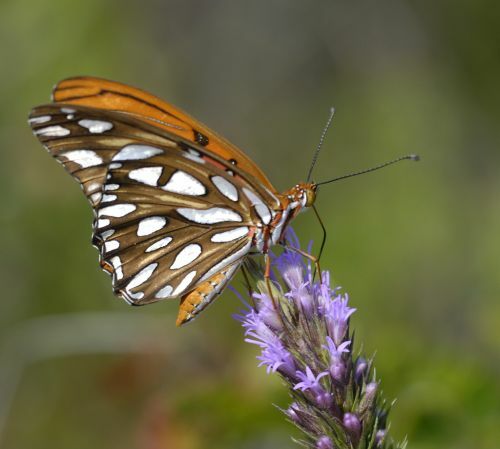 This untilled landscape of Pontotoc Ridge Preserve has proven to be a regional hot spot of butterfly diversity, boasting over 90 species documented at the preserve to date. Each year, volunteers gather to help survey butterflies which helps measure the success of our efforts to restore biodiversity at the preserve. 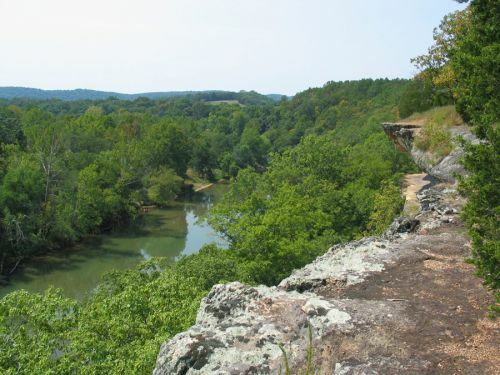 The J. T. Nickel Family Nature and Wildlife Preserve is the largest privately protected conservation area in the Ozarks. The preserve was formed in 2000 as the result of a land gift from the John Nickel Family. 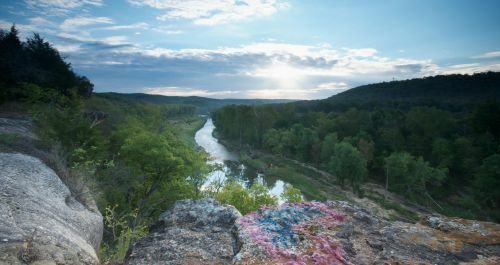 This 17,000-acre landscape rests in eastern Oklahoma's rolling Cookson Hills and overlooks the Illinois River. Spring-fed creeks meander amid a rugged topography of steep slopes and narrow valleys harboring a mosaic of oak-hickory forest, lofty pine woodland, and a diverse mix of savanna, shrubland, and prairie. The preserve provides optimal habitat for a suite of uncommon breeding bird species, including some whose survival requires large blocks of intact habitat. Learn about The Nature Conservancy's Plans to restore the Nickel Preserve. The blue-winged warbler (Vermivora cyanoptera) is a small songbird that is found in shrubland and overgrown fields. Although the bird is not especially shy, it can be challenging to observe. It's diet consits of insects and spiders. 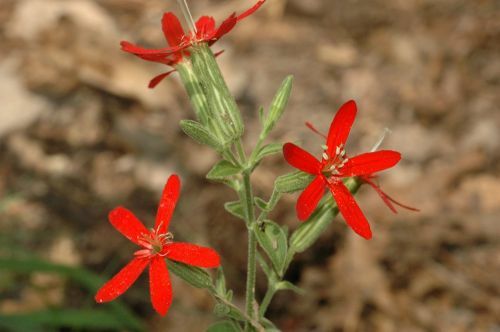 Royal Catchfly (Silene regia) is a herbaceous perennial plant that reaches 2-3 feet tall. This rare plant can be found in upland forest openings, savannas, and along roadsides. Its bright red petals attract butterlies and hummingbirds. Ozark Chinquapin (Castanea ozarkenis) is the most rare tree species on the preserve. This tree is in the American Chestnut family. Most growth is small regrowth sprouts, reaching 15-20 feet tall with dead sprouts killed by the chestnut blight disease. Little Bluestem (Schizachyrium scoparium) is a native warm season grass that grows natually on the preserve. 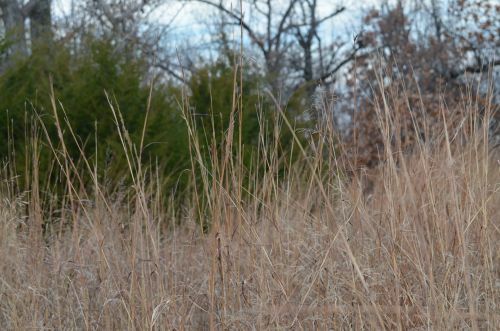 Bobwhite quail prefer nesting in Little Bluestem over other grasses. Nickel staff and volunteers have hand collected hundreds of pounds of native seed from local remnant prairies. This seed is then planted on the preserve within designated prairie restoration sites. 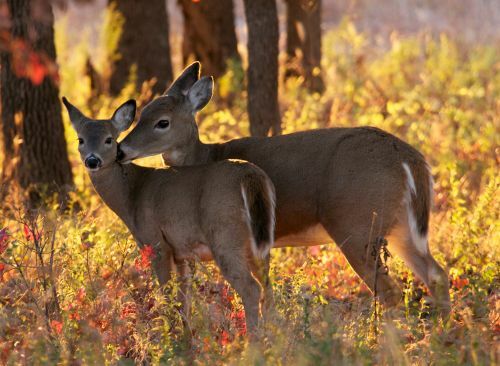 Whitetail Deer (Odocoileus virginianus)is a common deer species that can be seen on the preserve. Over 760 plant species have been cataloged from the Preserve thus far, with the majority being "forbs" or wildflower species. Although wildflowers bloom throughout the growing season, the primary peak is in the spring, followed by another in late summer. 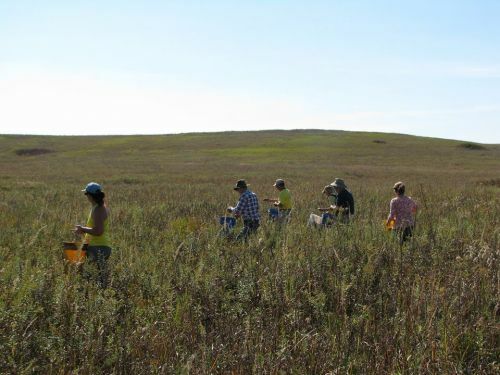 The purpose of the Tallgrass Prairie Docent Program is to promote The Nature Conservancy's mission of scientific conservation through tallgrass prairie ecosystem restoration at the Tallgrass Prairie Preserve. Docents explain the Conservancy and preserve mission to visitors provide information about the preserve history, status, bison herd, tall grasses, etc. They also answer visitor questions and staff the visitors center gift shop. In order to conduct these activities effectively, docents are trained in preserve policies and visitors center procedures. Wallowing is practiced by both sexes and all age classes. Wallows are usually in dry areas, but wet areas may be used. This behavior seems to be important in grooming, sensory stimulation, alleviating skin irritation, and reproductive behavior. Dust, which packs into the hair after wallowing, probably minimizes the effects of insects. Wallows also serve as water reservoirs, making small ponds that become available to vertebrates and invertebrates for multiple uses; in addition, such ponds enhance growth of specific vegetation needing moist or wet habitat. Wallowing behavior also transports soils and seeds to other areas because the thick fur on the head and forequarters is ideal for dispersal of awned, barbed, and sticky materials. 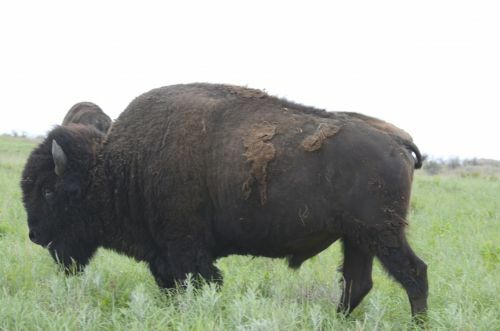 Male bison, known as bulls, are kept on the Preserve until they reach the age of 6 years old. At this age, they will reach a height of over 6 ft at the shoulder and weight almost 1 ton. The "rut" or breeding season is in July and August. A word to the wise: don't get between a bull and his intended mate! Female bison, known as cows, are kept on the Preserve until they reach the age of 10 years old. At this age, they will reach a height of over 5 ft at the shoulder and weight about 1,000 pounds. Bison calves are usually born in the spring during the months of April and May. 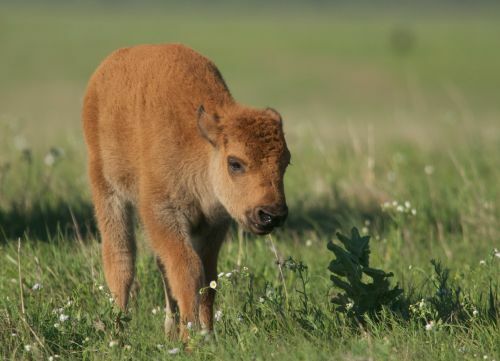 When the baby bison are born they weigh approximately between 80 and 120 pounds and are a bright orange color. The calves are typically known as "red calves" at this age. In 2008 the Tallgrass Prairie Preserve reached it\'s target herd size of about 2,200 over-wintering adults, with 600-700 calves born every spring. The herd is free to move across its 24,000-acre unit, interacting with prescribed fires that are conducted in all seasons, just as in presettlement times. The result is a fire-induced rotational system, providing a broad diversity of habitats that support the complete array of biological diversity. 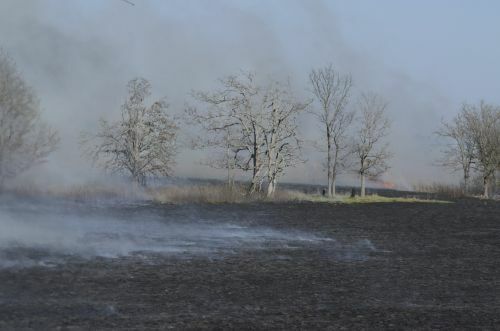 Research by Oklahoma State University confirms that this "patch burn" approach offers huge rewards for wildlife and plant diversity. Today the cowboys use feed trucks to move the bison during the round-up. They bait the animals with cattle feed to move them closer to the corrals. 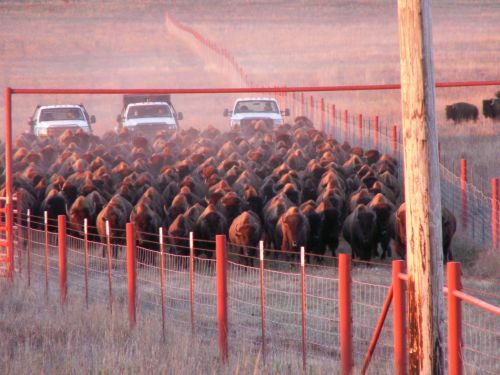 This creates a safer and low stress environment for both the bison and cowboys. Most round-ups occur in the fall, but on the rare occasion a roundup is necessary in the spring to ensure the health of the bison herd. 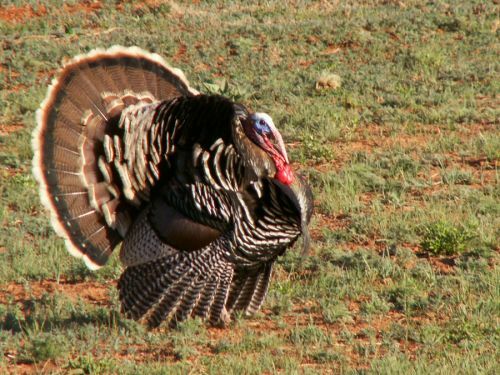 Wild turkeys (Meleagris gallopavo) are found throughout the oak woodlands and pine-oak forests in eastern Oklahoma. The wild turkeys are dusky brown, barred with black and iridescent bronze and grow 36"-48" tall. 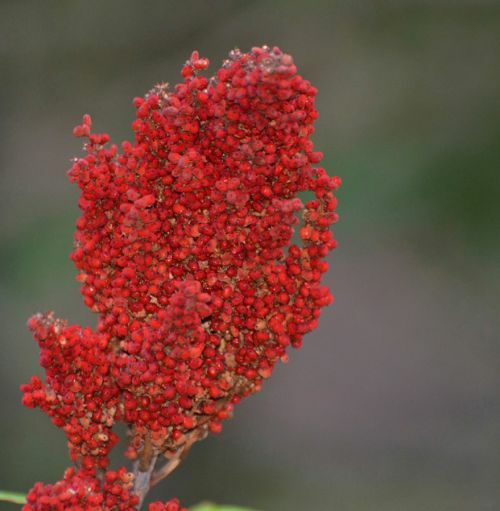 Throughout the tallgrass/savanna settings of the preserve, small shrubs known as "winged sumac" (Rhus copallina) can be seen. Winged sumac provides cover for quail and other small mammals. 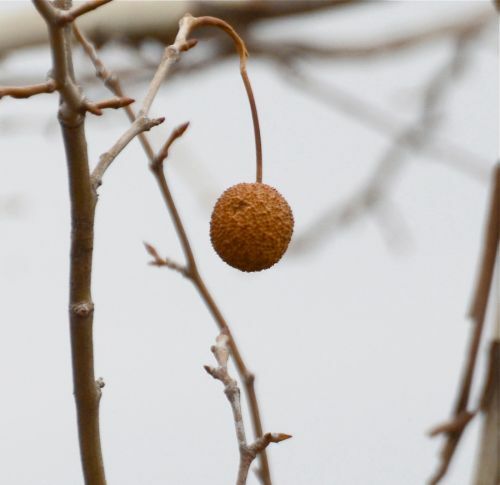 The long lasting fruit is high in vitamin A and is an important wildlife food in late winter. Pilliated woodpeckers (Dryocopus pileatus) can be seen at the preserve in and along the borders of the mature forested areas. These fascinating birds have black and white neck stripes and a prominent red crest. Males have a red "mustache marking", while females have black. 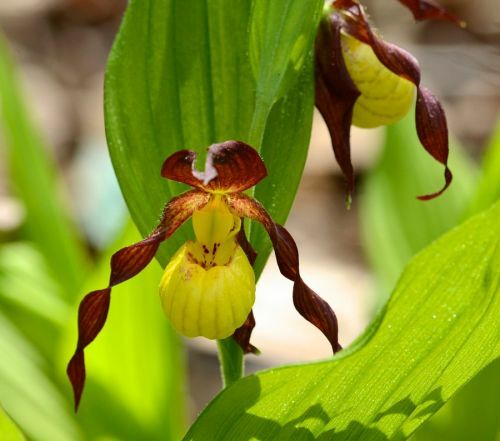 In late April-May, there is a showy, rare orchid that blooms at the preserve: Cypripedium parvflorum, also known as "yellow lady slippers". These orchids grow in shaded pine-oak/hickory bottoms. Invasive species such as sericea lespedeza (Lespedeza cuneata) threaten to replace diverse communities of native grasses and wildflowers. The Nickel Preserve is perhaps the last landscape-scale opportunity to address these threats in the Oklahoma Ozarks by protecting and restoring a fully-functioning ecosystem. Sericea lespedeza is a noxious, non-native, invasive plant and is the preserves' most aggressive invader. 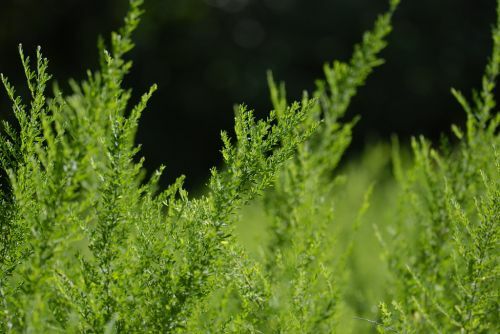 Learn more about sericea lespedeza at the Nickel Preserve. The savanna habitat features grassland with scattered trees and is found throughout the 17,000-acre Nickel Preserve. The trees may be oaks or pines that are well-spaced or in small clusters. There may also be extensive areas of shrubs and tree resprouts. Different grass species and wildflowers are abundant throughout the woody stemmed species. The savanna habitat requires a frequent fire regime. 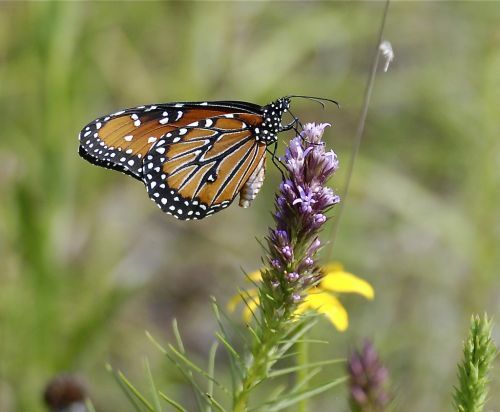 Learn more about the savanna habitat at the Nickel Preserve. Trail Head for the Pine Ridge Hiking Trail, one of three self-guided hiking trails at the preserve. Each are open during daylight hours. 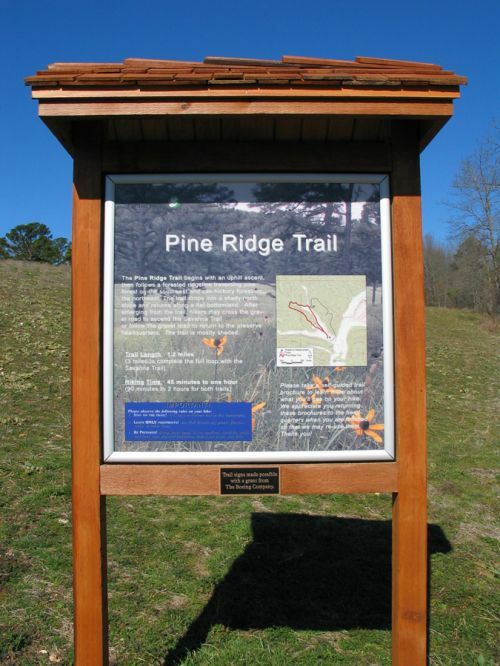 The total length of the Pine Ridge Hiking Trail is 1.2 miles. Hikers will see flashes of brilliant turquoise blue as male indigo buntings (Passerina cyanea) fly around the preserve in the brushy slopes, fields grown to scrub, and forest edges adjacent to the fields. 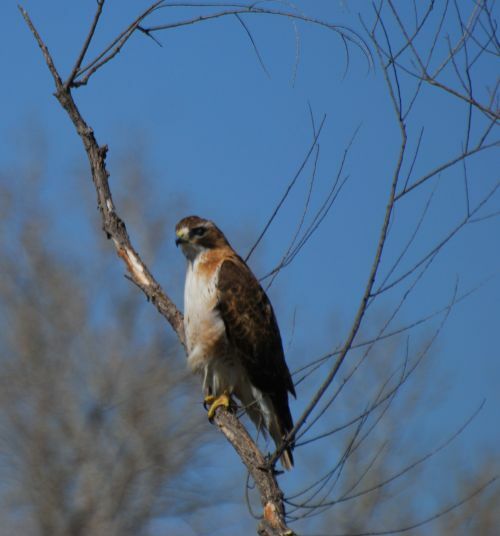 Red-tailed Hawk (Buteo jamaicensis) are often a common sighting on the Nickel Preserve. 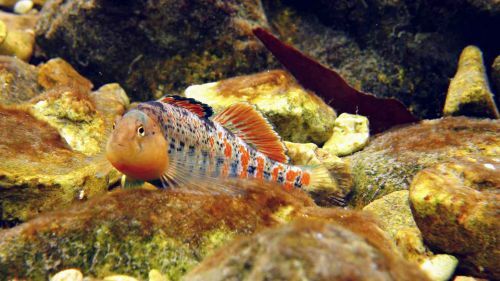 Adults have a uniformly reddish colored tail. Red-tailed hawks are excellent hunters that spot their prey from high above and swoop in for a quick kill. 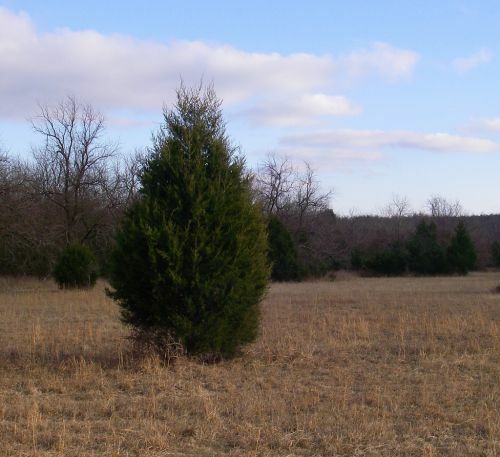 Easter Red Cedar (Juniperus virginana) is a native tree to Oklahoma. Even though it's native many people consider this tree to be invasive due to its ability to out compete other herbaceous plants. They can dominate the landscape if they are not keep under control. To determine the biological potential for restoring elk to the Nickel Preserve, including habitat suitability, range requirements, and disease risk. 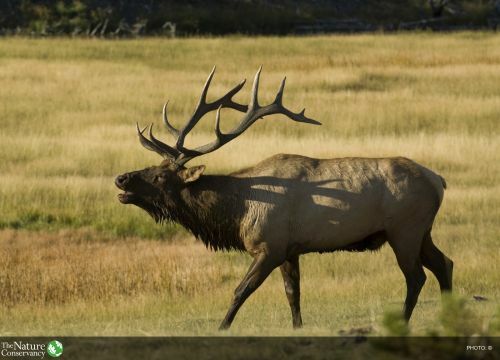 To assess the sociological factors potentially affecting a successful elk reintroduction program, including agricultural conflicts, poaching, roads, land ownership, and public attitudes. The study found that suitable elk habitat exists on the Nickel Preserve, especially in the northern and eastern areas where fire management has been used in recent years. Sparse development and low road densities were considered especially favorable. 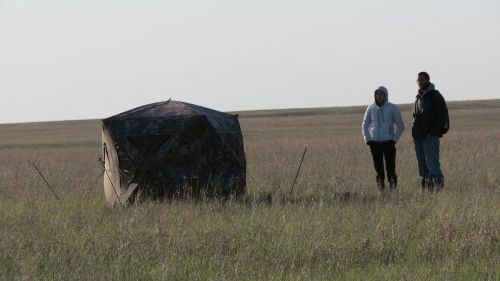 Meetings held with neighboring landowners found favorable opinions and cooperative attitudes toward elk reintroduction. A herd of 20 free-ranging elk was introduced to J.T. Nickel Preserve in 2005. The herd continues to grow and thrive. The Nickel Preserve has some beautiful fall foliage. 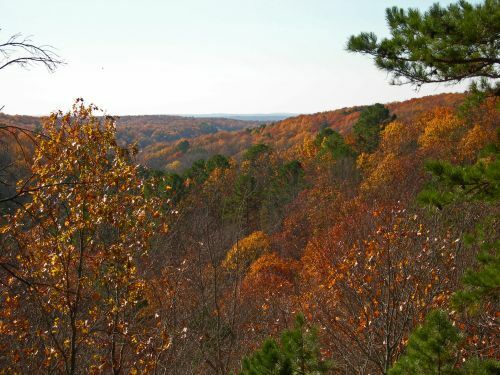 Vista's provide excellent fall foliage viewing opportunities. Peak foliage color varies from year to year. Red-Headed Woodpecker (Melanerpes erythrocephalus) prefers open woodlands. Often perching in open areas the adults head is entirely red. Restoration efforts on the Nickel Preserve has created ideal habitat for the Red-Headed Woodpecker. 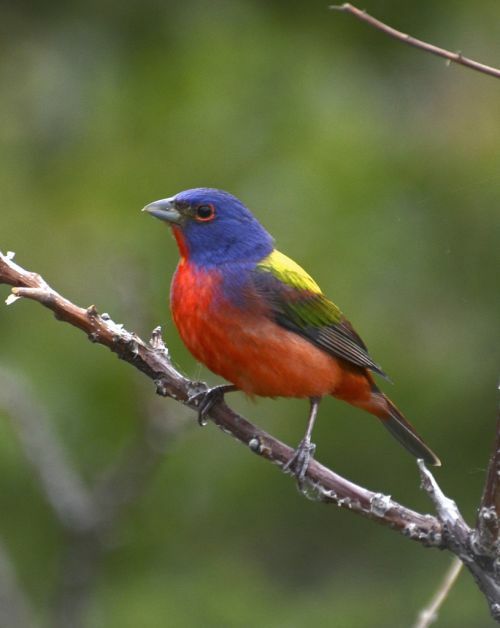 This bird is often viewed by birders visiting the preserve. Northern Bobwhite (Colinus virginianus) is found in open fields, brush, and open pinelands. 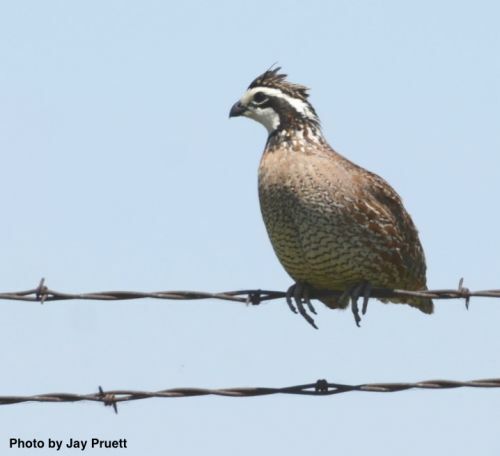 Bobwhite quail will winter in flocks called (coveys) with as many as 30 birds. Although once common, Bobwhite quail population size has decreased over the years. 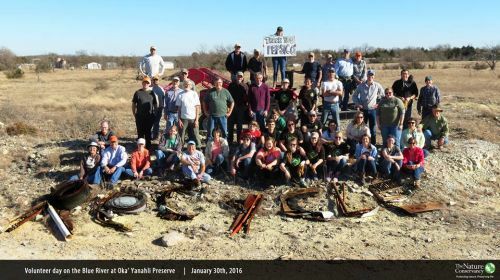 Restoration efforts at the Nickel Preserve are taking place in hopes of restoring quail numbers on the Preserve. 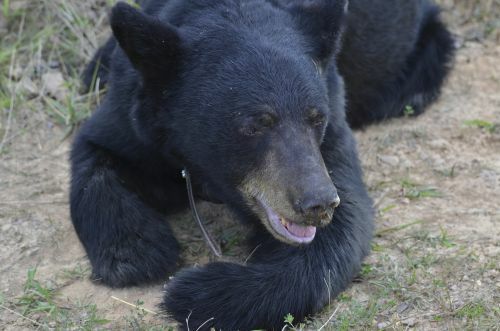 After an absence of perhaps a century or more, black bear have returned to the Nickel Preserve. At least two individuals now reside on the preserve, and the population is expected to continue to grow in future years. The new immigrants are the result of an expanding population in eastern Oklahoma and western Arkansas. 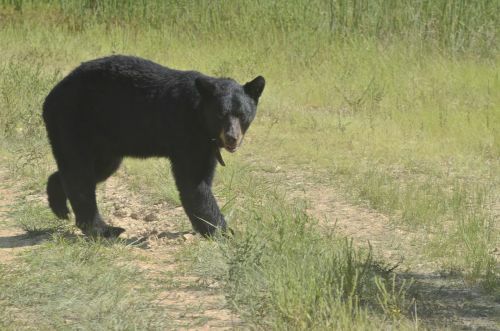 In spite of their fierce reputation, black bears are solitary animals that tend to shun people. Bears will undoubtedly be attracted to the rugged topography, remoteness, and forested habitats of the Nickel Preserve. Forest, woodland, and savanna restoration activities are expected to provide more of the dense cover and abundant forage that bears prefer. Burgen Sandstone Layer to over 450 million years old. Burgen sandstone is a course grain quartz stone. Occurs at the surface along streams and along the Illinois River. 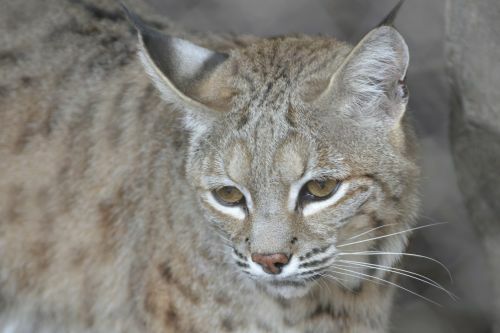 Bobcat (Lynx rufus) is a very elusive mammal, known for their beautiful soft coat and spotted markings. They are very stealthy and possess amazing hunting skills. 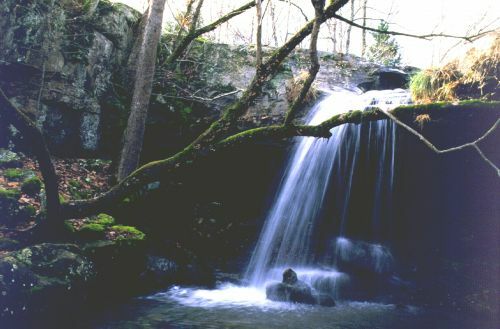 The Nickel Preserve has several spring-fed streams. These streams supply many species with clean and clear water as well as an environment for many aquatic species that call the streams home. Gray Fox (Urocyon cinereoargenteus) sightings are not common on the preserve but the gray fox does inhabit the preserve. Gray fox eat small mammals, fruit, berries, and insects. The gray fox can even climb trees in search of a food source. 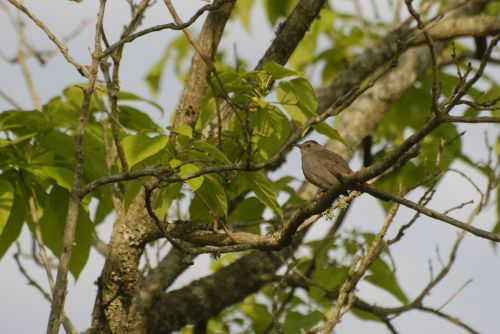 Gray Catbird (Dumetella carolinensis) is common near dense cover. This bird is named for its destinct meowing call. 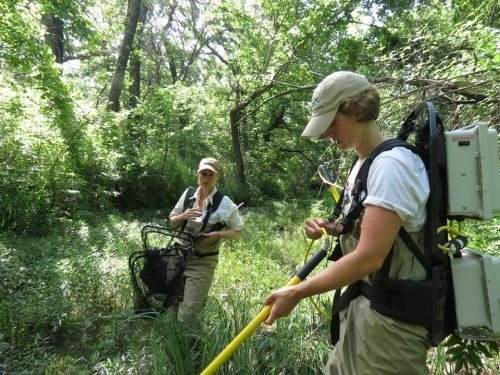 The Nature Conservancy is a leader in freshwater science and habitat restoration. With your generous support, we work to benefit the health of the Arbuckle-Simpson Aquifer through collaboration, restoration, stewardship and protection. The Red-Spotted Toad is a small toad species that has a flattened head and body, and is light grey, olive or reddish brown. 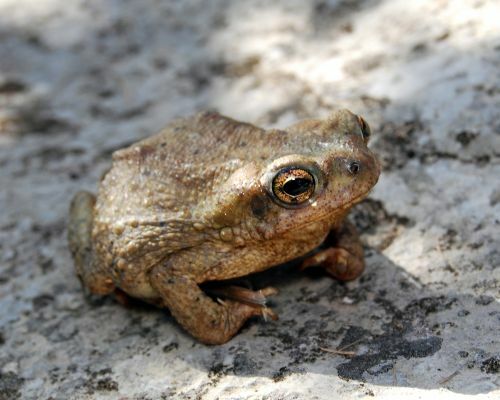 This toad is native to the southwestern United States and northwestern Mexico. It occurs primarily along rocky streams and riverbeds, often in arid or semi-arid regions. It is very localized on the coastal slope, but widespread in the deserts. In dry areas it needs seasonal pools or even temporary rain puddles to use for breeding. 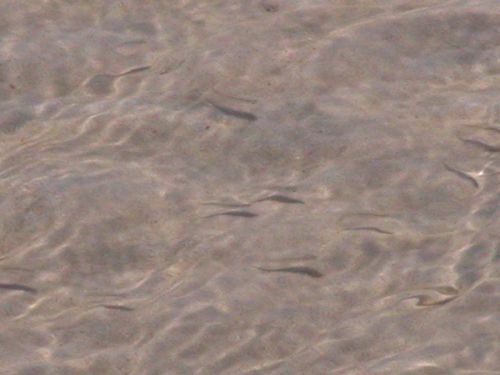 Eggs hatch in three days and the tadpole can transform in 6-8 weeks, taking advantage of the ephemeral water bodies. It spends dry periods in burrows or beneath rocks or moist plant matter, and becomes suddenly active during rainfall when multitudes of individuals emerge. The larval stage of large dragonflies lasts up to five years in large species, and between two months and three years in smaller species. Dragonflies in temperate areas can be categorized into two groups, an early group and a later one. In any one area, individuals of a particular "spring species" emerge within a few days of each other. 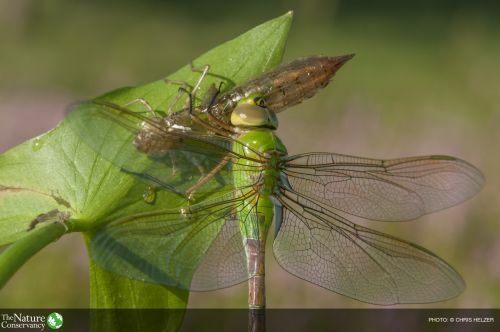 The springtime darner, for example, is suddenly very common in the spring, but has disappeared a few weeks later and is not seen again until the following year. By contrast, a "summer species" emerges over a period of weeks or months, later in the year. They may be seen on the wing for several months, but this may represent a whole series of individuals, with new adults hatching out as earlier ones complete their short lifespans. Like all of the preserves, Pontotoc Ridge Preserve has its own battles with invasive species. On their home turf, plant and animal populations are kept in check by natural controls, like predators and food supply. However, when a species is introduced, accidentally or intentionally, into a new landscape- one not adapted to its presence-the consequences can be devastating. "Invasive" plants and animals sometimes spread unchecked, disrupting natural cycles, crowding out native species and costing billions in property damage and lost economic productivity. 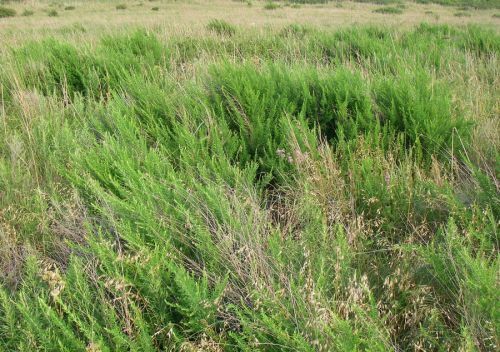 Invasive species threats on Pontotoc Ridge Preserve include sericea lespedeza, eastern redcedars, and feral hogs. The hot, rocky hillsides of the Southwest can look inhospitable on a baking summer day, but they’re exactly the kind of place Rufous-crowned Sparrows call home. These bulky, long-tailed sparrows forage on the ground beneath sparse shrubs and grasses. These are attractive sparrows with reddish toned upperparts and neat gray underparts, accentuated by a white eyering and a white malar or whisker stripe on the face. 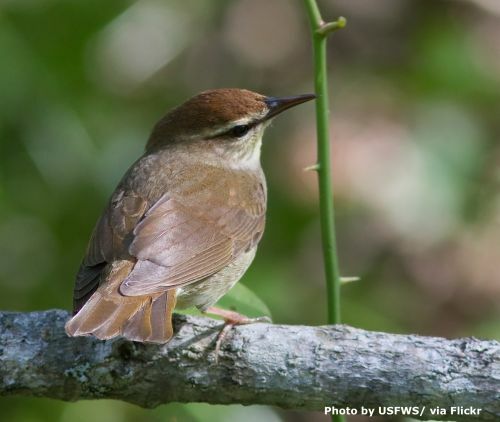 Males sing a short, jumbled song with a bubbly quality that recalls a House Wren. Travertine is a terrestrial sedimentary rock, formed by the precipitation of carbonate minerals from solution in ground and surface waters, and orgeothermally heated hot-springs. Our efforts to approach conservation in a pragmatic, collaborative way have served us well for more than two decades. It is for that very reason we are applying this philosophy to our stream work across the state, through our freshwater program. Since the launch of the program in 2012, we completed a three-year monitoring plan on 15 streams at various Conservancy preserves. With the help of staff and volunteers we collected aquatic data on the biology, water-quality, hydrology, and geomorphology. This data will be utilized to refine conservation strategies and track conservation strategies and track conservation results in the future. Pontotoc Ridge Preserve is premier Arbuckle Plains property located on top of the Arbuckle-Simpson Aquifer, providing critical recharge for the aquifer. This 2,900-acre landscape rests in south-central Oklahoma and holds bottomland forests, oak savannas (essential for migratory birds like painted buntings), mixed-grass and tallgrass prairies, springs and cool running streams. This untilled landscape has proven to be a regional hot spot of butterfly diversity, boasting over 90 species documented at the preserve to date. 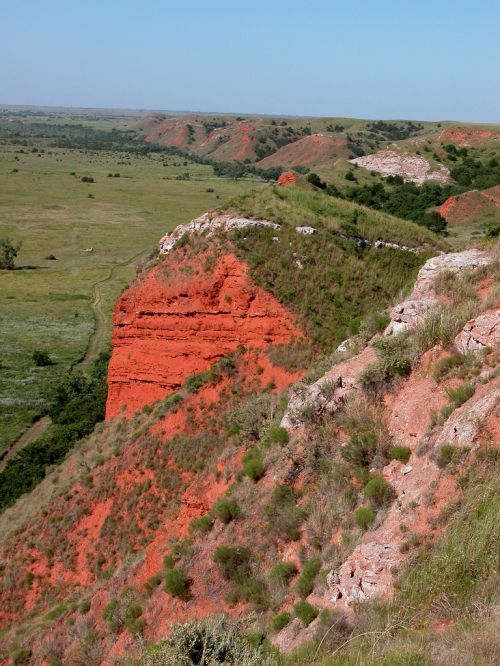 Whether it's cactus, bluestem or mountain boomers, Pontotoc Ridge Preserve is an excellent example of Oklahoma's ruggedly beautiful lands. The original property that formed the preserve was a gift from the Buddy Smith famiWhat the Conservancy is doing now currently centers around prescribed burning. Fire was a naturally occurring event in this ecosystem, yet landowners and communities have shied away from conducting prescribed burns due to the lack of training and equipment and burdensome prescribed burning laws in our state. 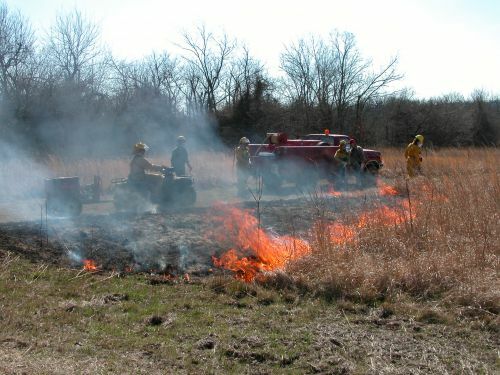 In the spring of 2003, the Conservancy conducted the first-ever prescribed burn workshop at the preserve for area landowners with help from fire ecology experts from Oklahoma State University. Bringing people and equipment together to put this powerful land management tool back to use will play a key role in managing this fire-dependent landscape. The Western diamondback rattlesnake (Crotalus atrox) is a heavy bodied snake with a triangular shaped head. There are two dark diagonal lines on each side of its face running from the eyes to its jaws. It has dark diamond-shaped patterns along is back. The tail has black and white bands just above the rattles. 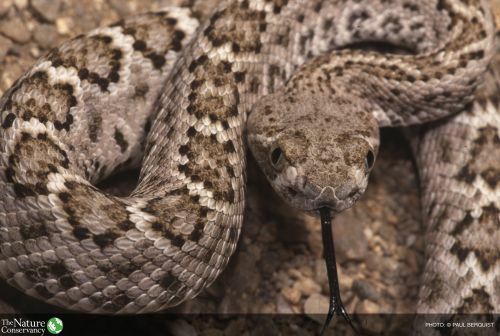 This snake is considered a generalist, which means that it isn't too picky about its habitat. It can be found living in deserts, grassy plains, forests, rocky hillsides and areas along the coast. It lives in elevations from below sea level up to 6500 feet (2000m). This species ranges throughout the southwestern United States (Arizona, California, New Mexico, Oklahoma and Texas) and northern half of Mexico. The eastern bluebird is a permanent resident throughout most of Oklahoma. Bluebirds are usually found in fields, open woodlands, parks or along golf courses or other open areas, including suburban locations with open spaces and scattered tress. The eastern bluebird has a musical flight call that often reveals its presence. The eastern bluebird nests throughout Oklahoma in appropriate habitat. One, two or three broods may be produced. Three to five light blue eggs are typical. 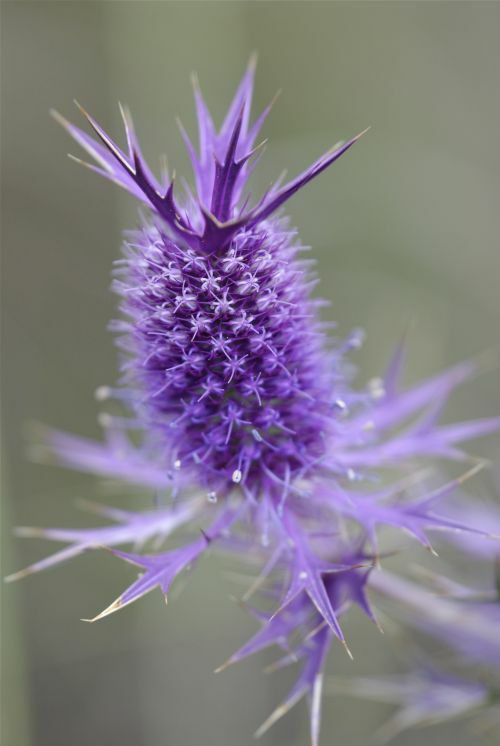 Leavenworth’s eryngo is a prickly, 20-40 in. annual with a leafy stem, broadly branched in the upper portion. Almost the entire plant has some shade of purple. Flowers are minute, purple, and mingled with small, spiny bracts in an elongated, terminal, head-like cluster. These are subtended by conspicuous spiny-tipped bracts. The leaves are deeply lobed, each segment edged and tipped with stiff spines. 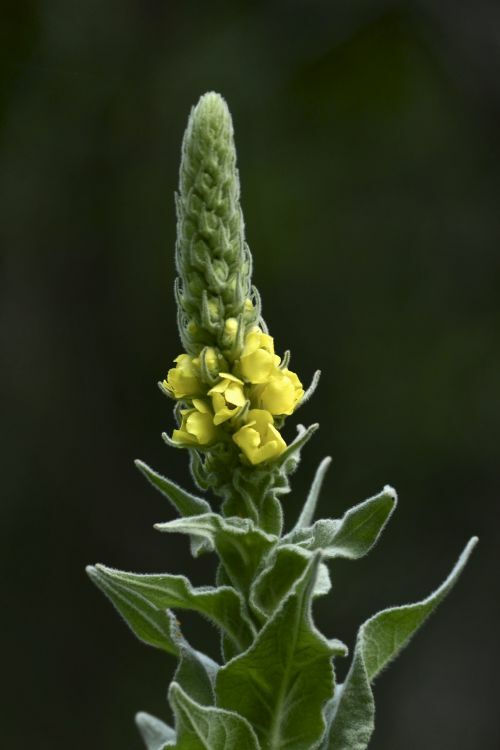 A tuft of small, rigid, spiny leaves grows out of the top of the flower head. The eryngos are not true thistles and are often confused with thistles, due to similarity in both appearance and habitat preference. Splashing fields a brilliant purple, it provides an excellent source for late summer and early fall color. 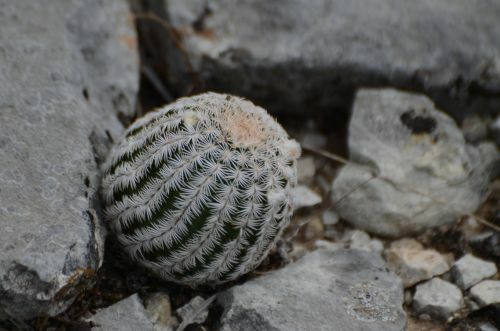 Like other cylindrical cacti, these cacti starts out as a sphere and gradually evolves its cylindrical form as it matures. This little plant rarely grows taller than 8 inches and is 2–3 inches across. The outer spines vary from 12 to 36 and are flattened against the stem. The central spines vary from none to 6 and project outward. The flowers are brilliant purple or rose-pink, 2–5 inches tall and almost as wide. There are 30–50 petals with ragged edges, sometimes notched. The base of the petals is usually reddish-brown. Stamens are cream-colored to yellow, and the pistil has many dark-green lobes, varying in number with each flower. "Karst" describes landscapes characterized by sinkholes, caves, underground streams, and other features formed by the slow dissolving of bedrock such as limestone or dolomite. Karst terrains provide unique subsurface habitat for rare animals, and their caves preserve fragile prehistoric materials. Karst landscapes are also among the most vulnerable to environmental impacts. Following storms, droughts and changes in land use, new sinkholes can form suddenly, collapsing to buildings, roads, and pastures. 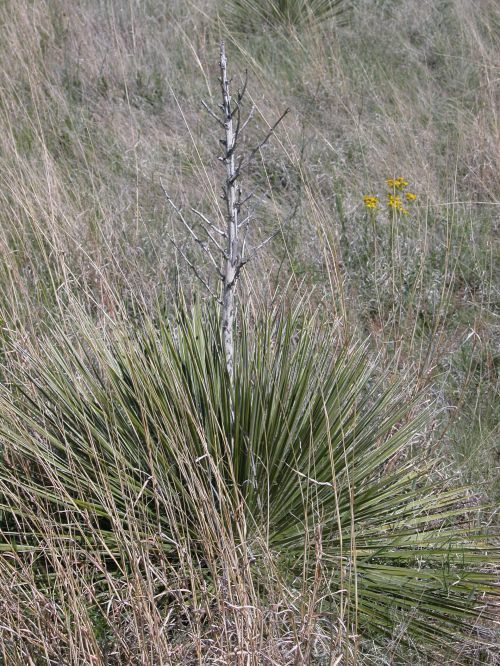 Yucca plants occurs throughout the Great Plains and is common in many habitats at the Pontotoc Ridge Preserve. Its flowering stalks are highly palatable to grazing animals. And... did you know that there is a moth that cannot survive without the yucca plant and the yucca plant cannot survive without this moth? 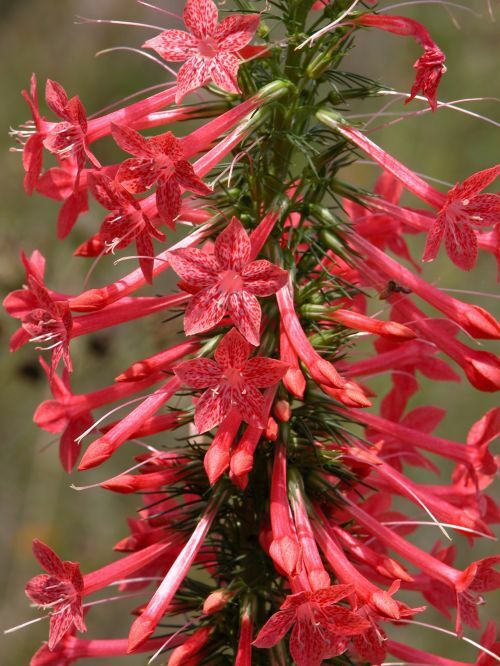 This spectacular red flowering biennial attracts butterflies and hummingbirds galore! It thrives in a wide range of soils from caliche to rich bottom lands. Grows from North Carolina to Florida to Texas. Plants bloom the second spring after planting. After its blooming period the second year, the plant reseeds readily before dying. Seedlings can be transplanted in late fall. Three species of hummingbirds are regularly found in Oklahoma. Two species, the Ruby-throated and the Black-chinned, nest in Oklahoma and are found here during the summer months. The Ruby-throated Hummingbird is the most common and widespread species. 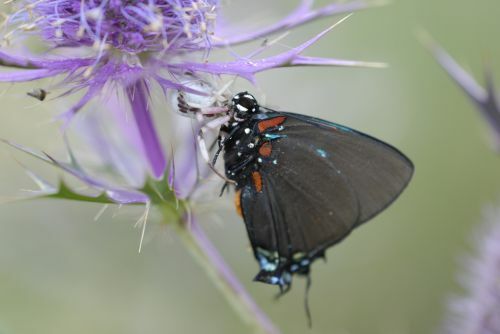 It is found across the eastern 3/4 of Oklahoma and is the only species found in the eastern half of the state. The Black-chinned Hummingbird is found in the western quarter of the state and is most common in the southwestern corner. It is the most common hummingbird around the cities of Lawton and Altus, and it has expanded its range eastward over the past three decades and is now common as far east as Chickasha. Ruby-throated and Black-chinned Hummingbirds return to Oklahoma in early spring – usually between the 10th and 20th of April. They remain here through the summer and migrate back south during September. Like many migratory land birds, the male hummingbirds typically return one to two weeks before the females in the spring and migrate south in mid-September about two weeks before the females and juvenile birds. Contrary to popular myth, hummingbird migration is not triggered by changes in their food supply but by changes in day length. In the fall, they migrate southward in September regardless of whether or not there is an abundance of flowers. Hummingbirds favor the Standing Cypress flower which is plentiful on Pontotoc Ridge Preserve. The eastern collared lizard (Crotaphytus collaris), also called common collared lizard, Oklahoma collared lizard or collared lizard, is a North American lizard that can reach 8–14 inches (20–36 cm) in length (including the tail), with a large head and powerful jaws. They are well known for the ability to run on their hind legs, looking like small theropod dinosaurs. Chiefly found in dry, open regions of Mexico and the south-central United States, the full extent of its habitat in the United States ranges from the Ozark Mountains to southern California. 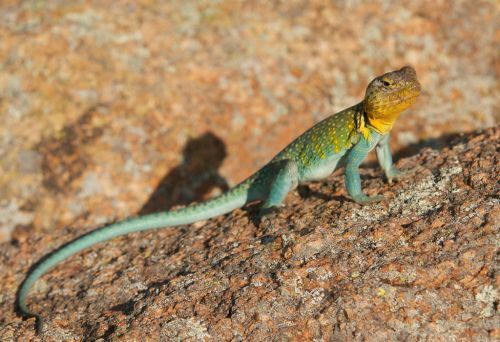 The collared lizard is the state reptile of Oklahoma, where it is known as the mountain boomer. 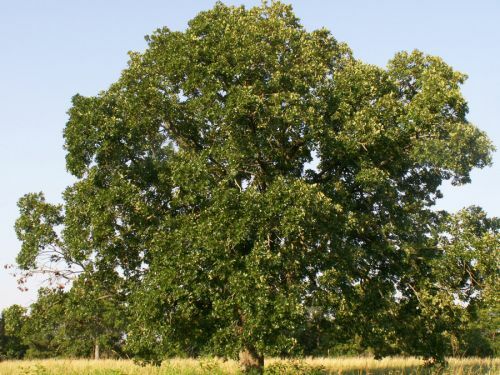 Post Oak (Quercus stellata) is one of the most common trees in Oklahoma and can withstand fire and drought. Acorns provide a staple food for many birds and mammals in the fall and winter. 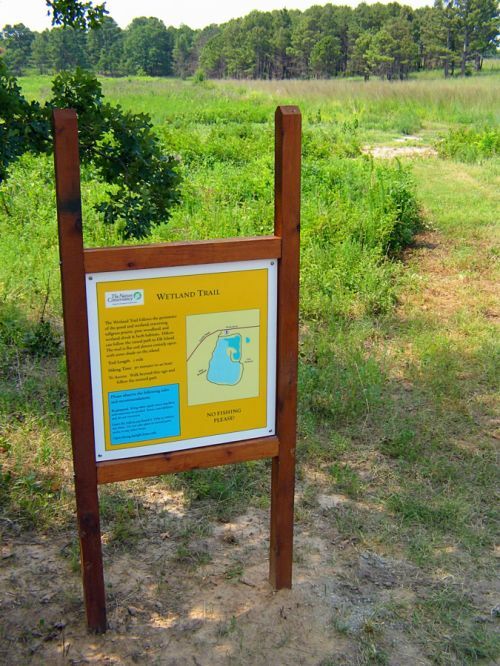 Learn more about the oak pine forest at Nickel Preserve. Seed heads are hand collected along roadsides and remnant prairies around the area. Seed heads are then processed to pure clean seed using a hammermill and is then weighed and recorded. The seed is then planted using a no-till drill into an existing prairie restoration area that has been burned prior to planting. Learn more about restoration and seed harvesting at the Nickel Preserve. The pond is used by many different species, migratory waterfowl, amphibians, and elk just to name a few. The elk use the pond for drinking water and they enjoy wading in the pond to cool down. The island received its name after viewing the elk on numerous occasions using the island. 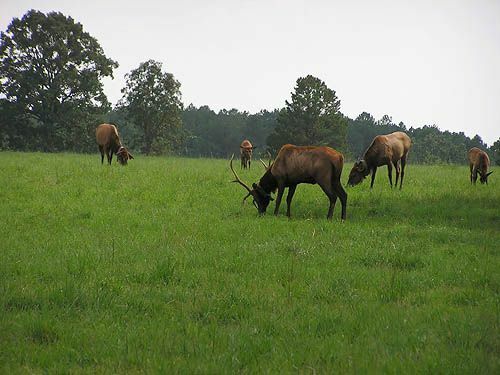 Elk were reintroduced to the preserve in 2005. 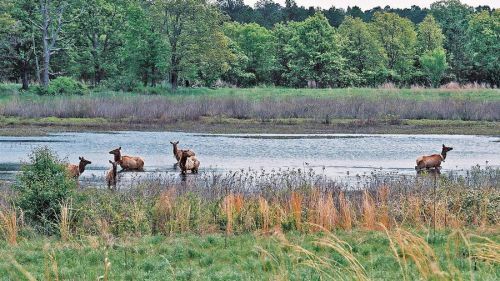 Learn more about the reintroduction of elk at the Nickel Preserve. This area was burned in March of 2012. Nutrients from the ash leach down into the soil helping plant regrowth. The lush new regrowth is desired by many mammals and critters. Elk, deer, and turkey immediately start using the fields. Spring flowers and grasses emerge from the black ash as the lifecycle of the plants start for a new year. 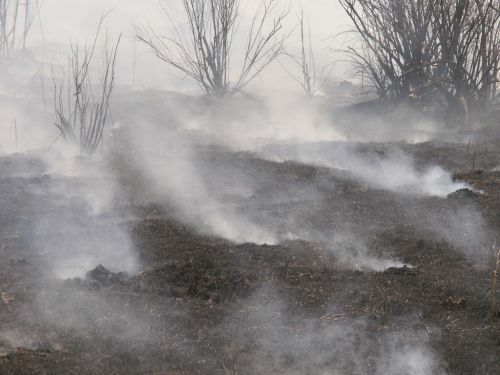 Burning the warm season grass fields is very important for the management and overall health of the fields. 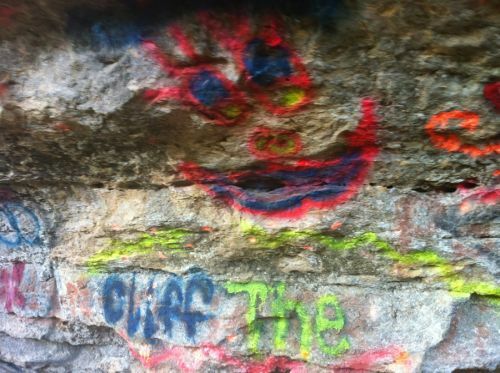 Learn more about the use of fire at the Nickel Preserve. Volunteers look throughout the fields for different butterfly species during the Nickel Preserve Butterfly Counts. These counts are a great tool for keeping records of the different species found on the preserve. This is one of the most conspicuous and characteristic shrubs of the upland prairie. The alternate common name Prairie Shoestring probably refers to the laced-shoestring look of the leaves and roots. The Preserve hosts 41 species of mammals. Watch for beavers in the water or along the creek banks, and white-tailed deer in the woods. Welcome to the historic bunkhouse at Tallgrass Prairie Preserve. Much of the furniture in the bunkhouse is original, including the dining-room table, two end tables, the china cabinet, and the sideboard. The original floors were concrete in the central section and wood in each wing. Heat was generated in gas stoves in each room. The preserve is open every day from dawn to dusk with no charge for admittance and can be accessed via county roads. There are free ranging bison herds, scenic turnouts, hiking trails, picnic tables, breezeway information and public restrooms at the Historic Bunkhouse. The gift shop / visitor center is open from March 1 through December 15 from 10:00am to 4:00pm. It is operated by docents, and is typically open every day. Click here to see if the Visitor Center is open during your visit. Bison are dangerous! 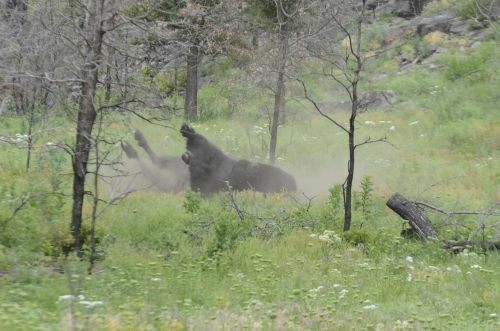 When viewing bison, there are three rules: #1: Stay in your car. #2: Stay in your car. And #3: Stay in your car! Please do not leave behind trash. Bring a bag and carry it out. The bronze sculpture is titled "Change of Seasons" and was created by T.D. Kelsey. 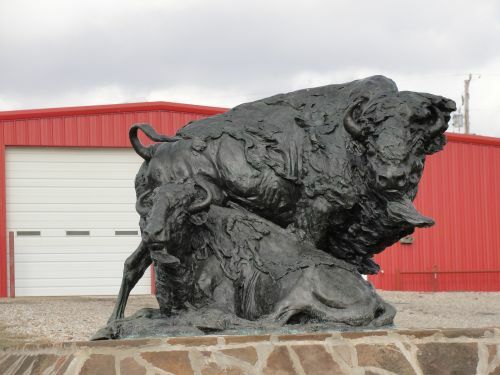 William and Joffa Kerr donated the sculpture to the Tallgrass Prairie Preserve in November of 2009. Commonly referred to as "The Shop", this building is where the cowboys meet on a daily basis. It contains everything they need to make the daily operations of the Preserve run smoothly. 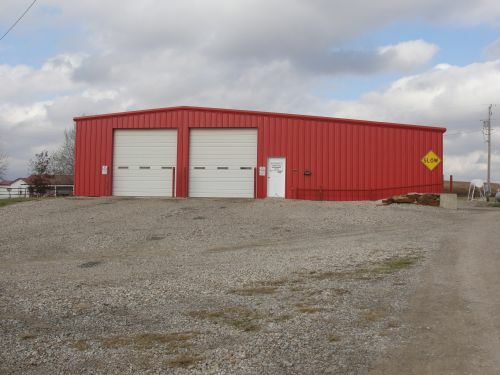 The shop is also where the Tallgrass Prairie Preserve fire trucks are built. The Nature Conservancy of Oklahoma invites you to enjoy the outdoors - and the places that you've helped us protect. From species surveys and volunteer workdays to hikes and educational presentations, there are many ways to both enjoy and support the work of The Nature Conservancy. Check back often for upcoming events.. The Oklahoma Chapter has a variety of ongoing needs for volunteers - join the cadre of dedicated volunteers who are making a difference. 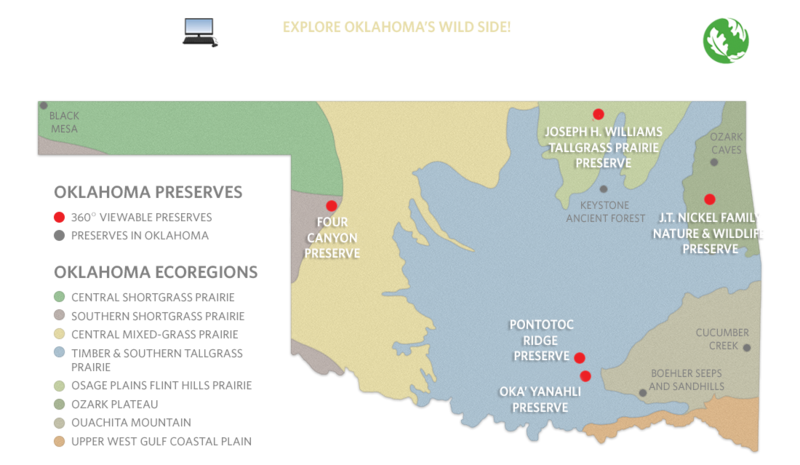 The J. T. Nickel Family Nature and Wildlife Preserve is near Tahlequah Oklahoma, the seat of the Cherokee Nation. At the Cherokee Heritage Center you can tour an ancient Cherokee village, a museum of Cherokee history and do genealogical research on Cherokee ancestors. 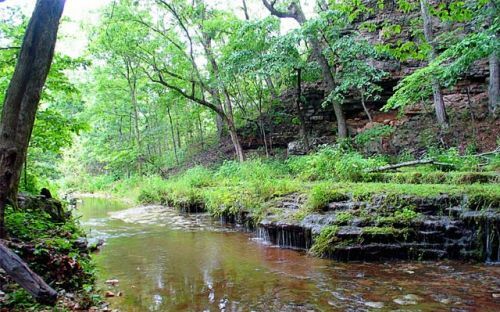 It is located near Park Hill, Oklahoma, which is a few miles south of Tahlequah, Ok.
Plan your visit to the Nickel Preserve! The preserve is open every day from dawn to dusk with no charge for admittance and can be accessed via county roads. There are free ranging bison herds, scenic turnouts, hiking trails, picnic tables, breezeway information and public restrooms at the Historic Bunkhouse. The gift shop / visitor center is open from March 1 through December 15 from 10:00am to 4:00pm. It is operated by docents, and is typically open every day. The bison on the preserve are free roaming, so please stay in your car. Since 1986, the Conservancy has worked to conserve Oklahoma’s magnificent landscapes and unique biodiversity totaling over 100,000 acres. 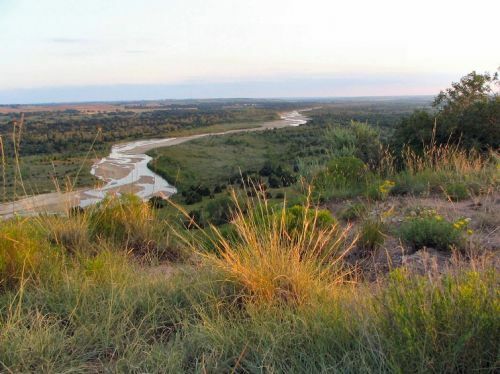 Nature Conservancy's Four Canyon Preserve encompasses 4,000 acres of mixed-grass prairie, rugged canyons, and floodplain along the Canadian River in southern Ellis County. Scenic prairie ridges traverse the landscape, dissected by deep chinquapin oak-lined canyons draining to the river. These prairies provide habitat for a number of rare grassland birds, such as Cassin's sparrow and Swainson's hawk, and additional species of concern including reptiles like the Texas horned lizard, as well as numerous state-rare plants. The cool, wooded canyons stand in contrast to the surrounding prairies, and provide habitat for birds like red-bellied woodpecker and painted bunting. The Canadian River on the preserve provides habitat for the federally endangered least tern, the threatened Arkansas River shiner, as well as stopover habitat for migratory shorebirds including the sandhill crane. Oka’ Yanahli Preserve is along one-mile of the Blue River, an iconic symbol of natural beauty and a precious resource for life and economic development in southern Oklahoma, a resource worth protecting and preserving. 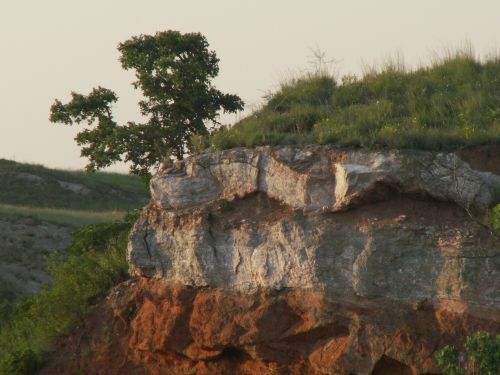 It has shaped the human history of Oklahoma and continues to be a source of life and biodiversity. The Blue River and the Arbuckle-Simpson Aquifer, which sustains the river, are globally significant for the wide assortment of endemic life they support. The Blue River basin encompasses a variety of freshwater ecosystems, from rolling limestone prairies to oak forests in granite canyons to bottomland hardwood forests. An astonishing array of plant and animal species depend on a healthy, sustainable Blue River basin, including the Blue River subspecies of orangebelly darter, orangethroat darter and least darter; ringed crayfish; rabbitsfoot mussel; chatterbox orchid; bald eagle, prothotary warbler and dozens of species of migrating birds. Seaside alder, found only in three widely disjunct parts of the United States—and arguably the rarest tree in North America—is more abundant on this river than anywhere else. It is also a critical source of water for human needs. 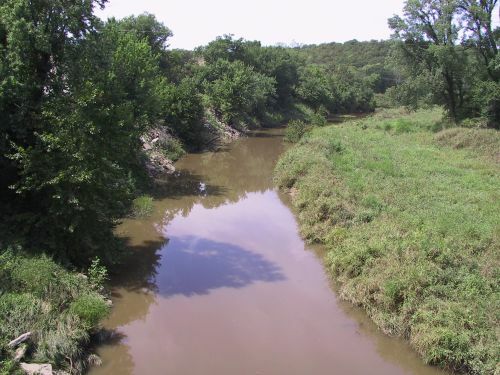 In addition to providing for agricultural needs, the river sustains the city of Durant. Ranked the fastest growing rural city in Oklahoma, Durant is home to Southeastern Oklahoma State University and the headquarters of the Choctaw Na!on of Oklahoma. 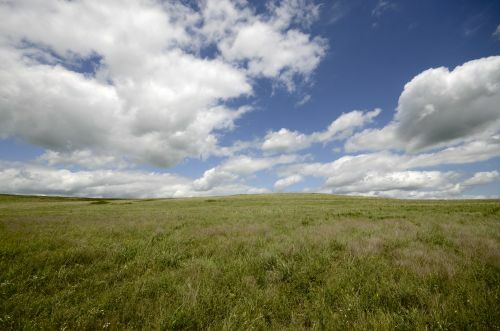 The Joseph H. Williams Tallgrass Prairie Preserve is the largest (39,000 acres) protected remnant of tallgrass prairie left on earth. Originally spanning portions of 14 states from Texas to Minnesota, urban sprawl and conversion to cropland have left less than 10% of this magnificent American landscape. 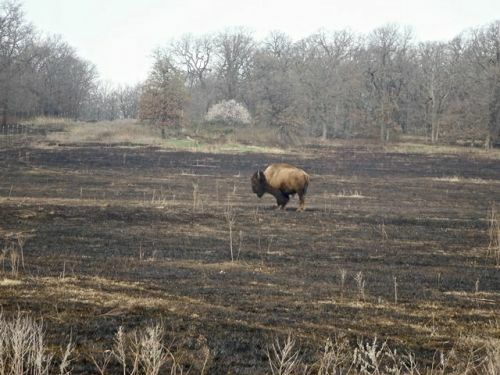 Since 1989, the Conservancy has proven successful at restoring this fully-functioning portion of the tallgrass prairie ecosystem with the use of about 2500 free-roaming bison and a "patch-burn" model approach to prescribed burning. The Illinois River is home to diverse wildlife including the bald eagle (Haliaeetus leucocephalus). The bald eagle is one of North America's largest raptors, its wing span stretching as wide as 8 feet. It lives on coasts, lakes and rivers from Alaska to Northern Mexico, migrating south in the winter only if necessary. One of eight fish eagles, its primary food source is fish, often stolen from other birds, but it also feeds on carrion, water fowl and small mammals. Contact Us - Fill out a contact form with with questions or comments.